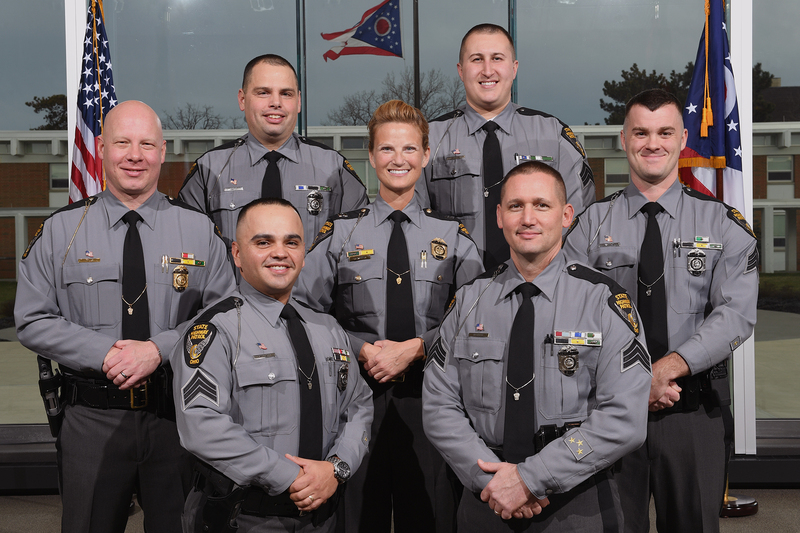 Please join us in congratulating the newly promoted members of the Ohio State Highway Patrol. Front row (L-R): Staff Lieutenant James M. Faunda, Training Program Manager Victoria L. Dowdy and Lieutenant Maurice Waddell. Back row (L-R): Sergeant Rocky J. Hise and Sergeant James P. King. 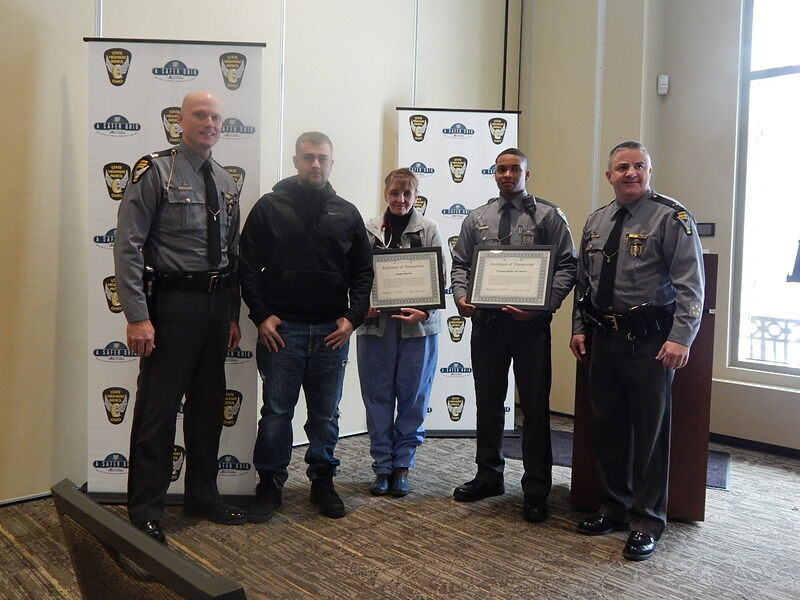 Congratulations to the winners of Ace and Criminal Patrol Awards who were recognized today! 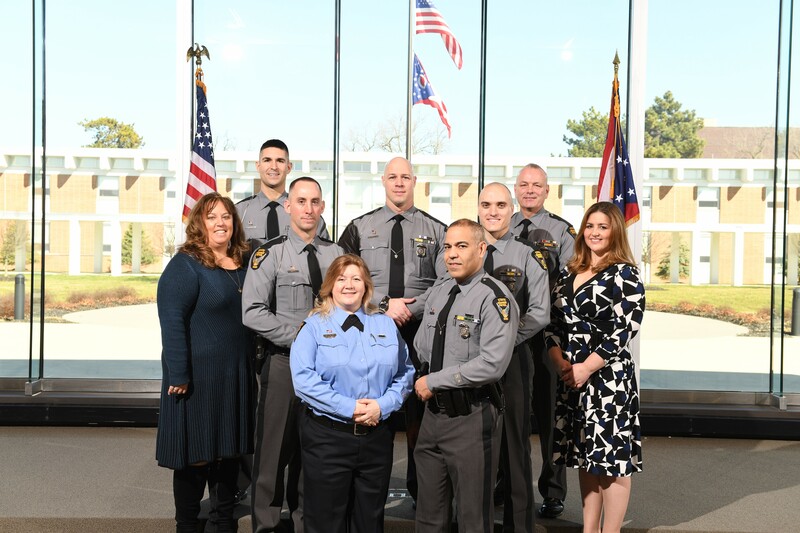 These troopers and dispatchers worked diligently to look "beyond the plate" in order to remove drugs from Ohio communities and return stolen vehicles to their rightful owners. One man is behind bars and two state troopers said they feel satisfied after rescuing a teenage girl. More. Two Ohio State Highway Patrol troopers are still processing how an OVI traffic stop escalated into a life-or-death situation in just a few seconds. More. An inmate worker who walked away from the Pickaway County Jail Wednesday morning is now back in custody thanks to help from Ohio State Highway Patrol troopers. More. Ohio State Highway Patrol troopers filed felony drug charges against an Ohio man after a traffic stop in Licking County. During the traffic stop, troopers seized a loaded JHP .45 caliber handgun, paraphernalia and more than 1 pound of methamphetamine worth approximately $10,000. Read More. 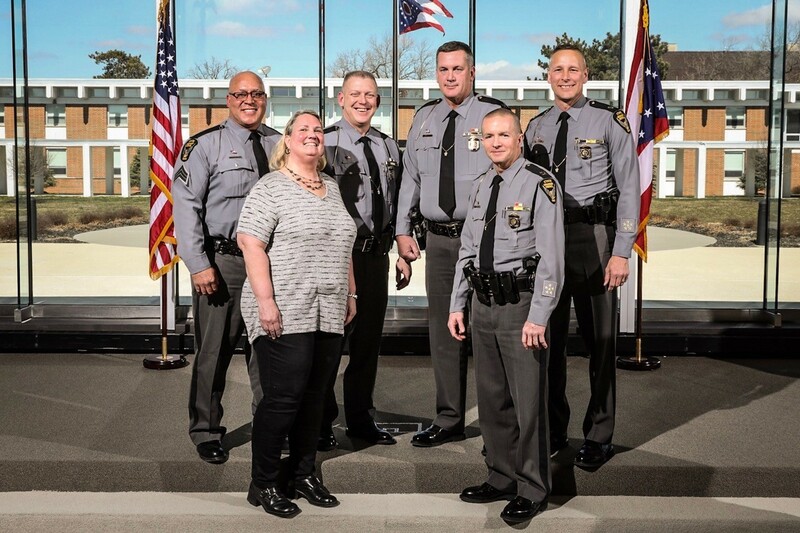 Ohio State Highway Patrol Sergeant David L. Robison, Trooper James M. Davis, Trooper Charles M. Gannon and Trooper Jason R. Hutchison were honored today for their heroic actions during a crash. Each were presented with the prestigious Superintendent&apos;s Citation of Merit Award, at the Piqua District Headquarters by Colonel Richard S. Fambro, Patrol superintendent. Read More. The Ohio State Highway Patrol singled out some area teen drivers in a good way on Tuesday. More. 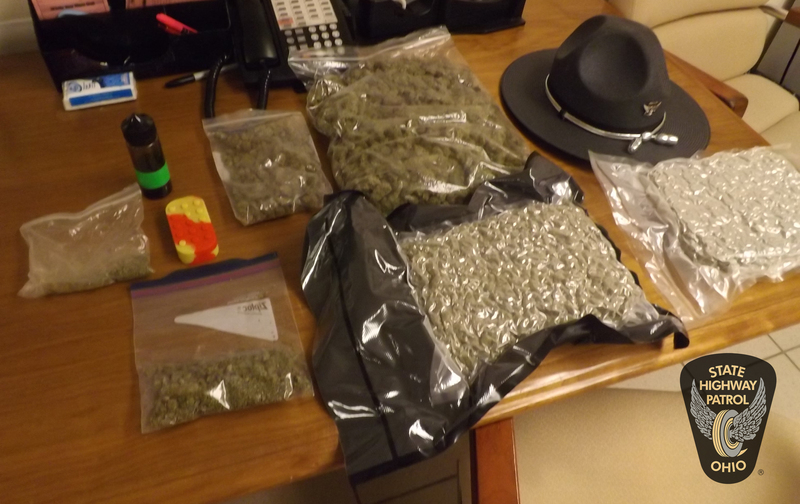 Ohio State Highway Patrol troopers filed felony drug charges against two Michigan men and one woman after a traffic stop in Scioto County. During the traffic stop, troopers seized 250 grams of heroin worth approximately $27,500. Read More. Prom season is just around the corner and Ohio State Highway Patrol is urging responsible teen driving. More. Ohio State Highway Patrol troopers filed felony drug charges against a New York man after a traffic stop in Ashtabula County. During the traffic stop, troopers seized 85 grams of methamphetamine worth $7,000. Read More. Ohio State Highway Patrol troopers filed felony drug charges against an Ohio man after a traffic stop in Summit County. During the traffic stop, troopers seized more than 2 pounds of cocaine worth $35,429. Read More. 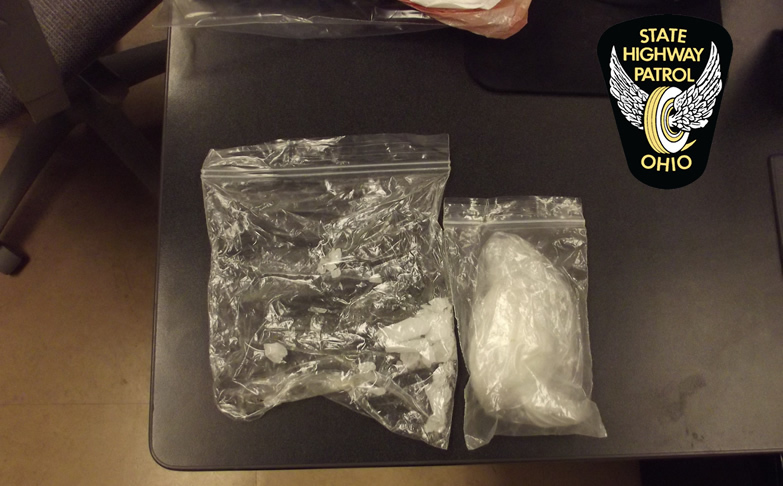 Ohio State Highway Patrol troopers filed felony drug charges against two Ohio men and one woman after a traffic stop in Hocking County. During the traffic stop, troopers seized 458 grams of methamphetamine, 49 grams of cocaine, 37 grams of suspected hashish, more than 1 gram of heroin and 1 gram of suspected crack cocaine worth approximately $39,360. Read More. 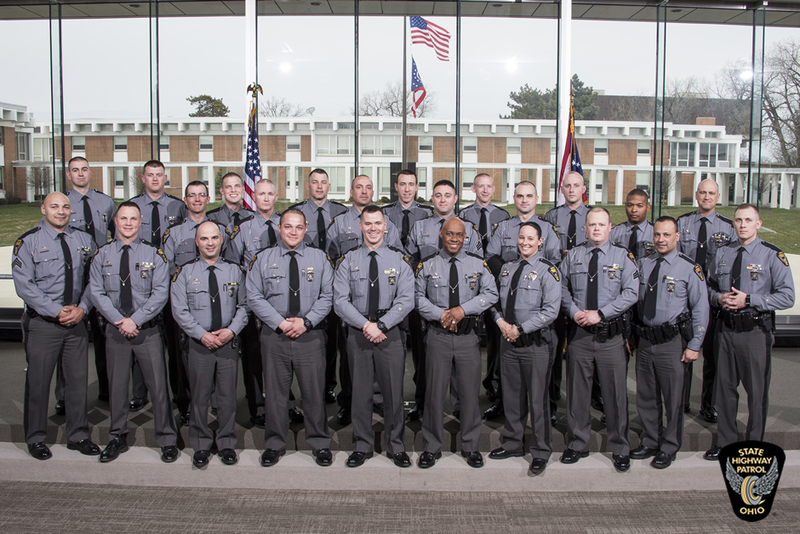 Please join us in congratulating the newly promoted members of the Ohio State Highway Patrol. Front row (L-R): Major Charles A. Jones, Major Robin R. Schmutz and Major Gary Allen. Middle row (L-R): Captain Steven R. Rine, Captain Christopher M. Johnson, Captain Marvin E. Hill and Captain Scott A. Demmitt. Back row (L-R): Sergeant John Beeler, Sergeant Scott R. Moore, Sergeant Cristian Perrin and Sergeant Timothy J. Kay. 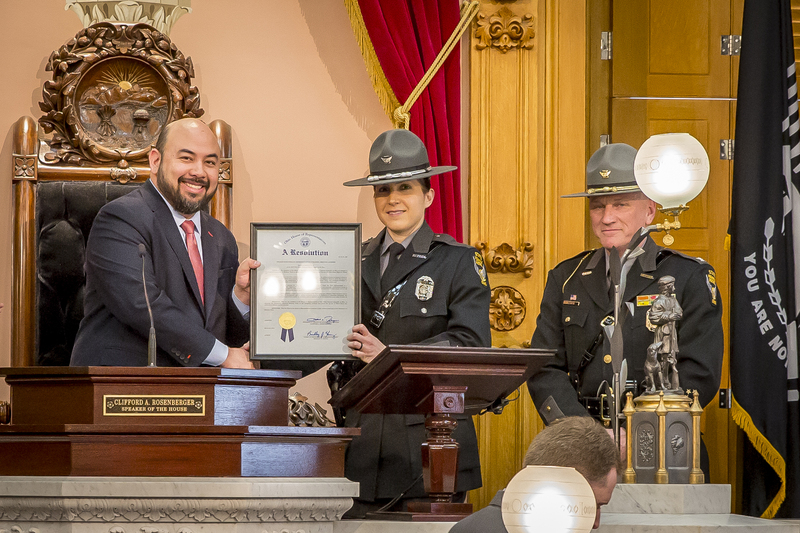 2018 State Trooper of the Year, Trooper James E. Hutchinson, was honored today at the Ohio Statehouse by Senator William Coley. 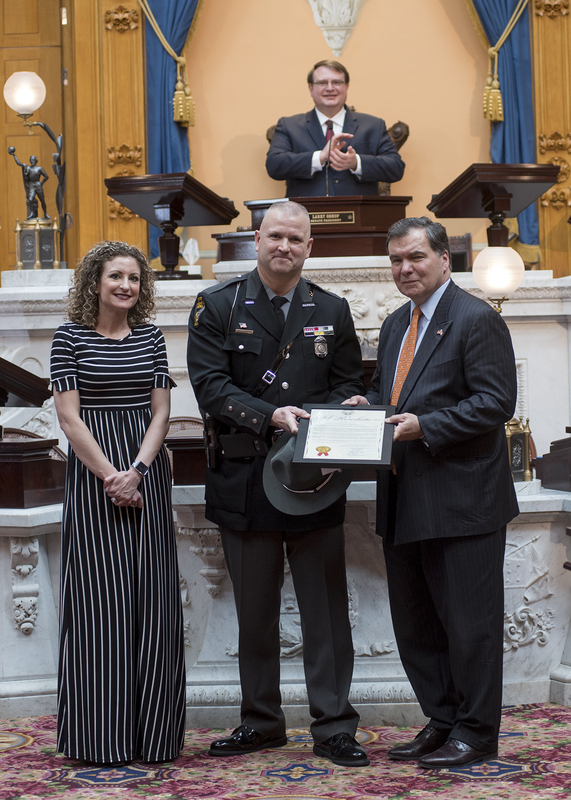 Lieutenant Colonel Richard S. Fambro was ceremonially promoted to the Ohio State Highway Patrol&apos;s highest rank today by Ohio Department of Public Safety Director Thomas J. Stickrath. 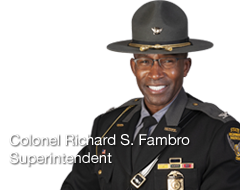 Colonel Fambro will serve as the 19th Superintendent of the Patrol, making history as he becomes the first African American to hold this position. 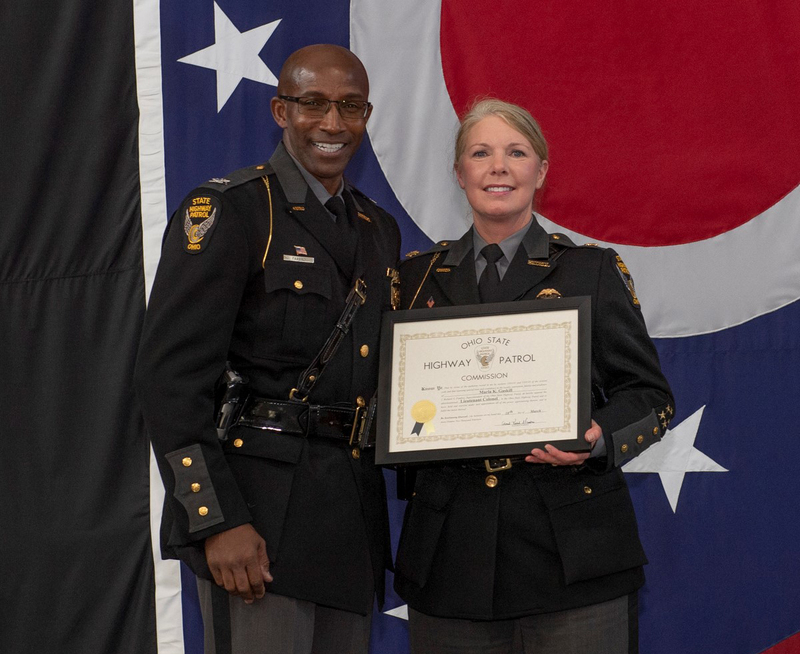 Major Marla K. Gaskill was promoted to the rank of lieutenant colonel today by Ohio State Highway Patrol Colonel Richard S. Fambro during a ceremony at the Patrol&apos;s Training Academy. Lieutenant Colonel Gaskill will transfer from her current assignment in the Office of Planning and Finance to serve as a lieutenant colonel in the Office of the Superintendent. Lieutenant Colonel Gaskill is the first woman to hold this position in Patrol history. Ohio State Highway Patrol troopers filed felony drug charges against a Texas man after a vehicle inspection in Clinton County. During the vehicle inspection, troopers seized more than 11 pounds of cocaine and 5 grams of marijuana worth $433,792 and a loaded Springfield XD .45 caliber handgun. Read More. Ohio State Highway Patrol troopers filed felony drug charges against a Michigan woman after a traffic stop in Wood County. 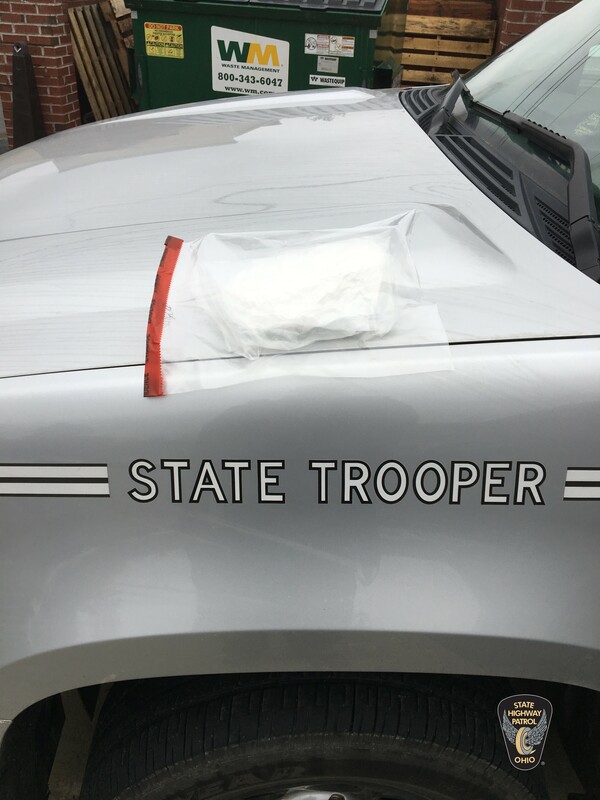 During the traffic stop, troopers seized 500 grams of cocaine worth $17,750. Read More. 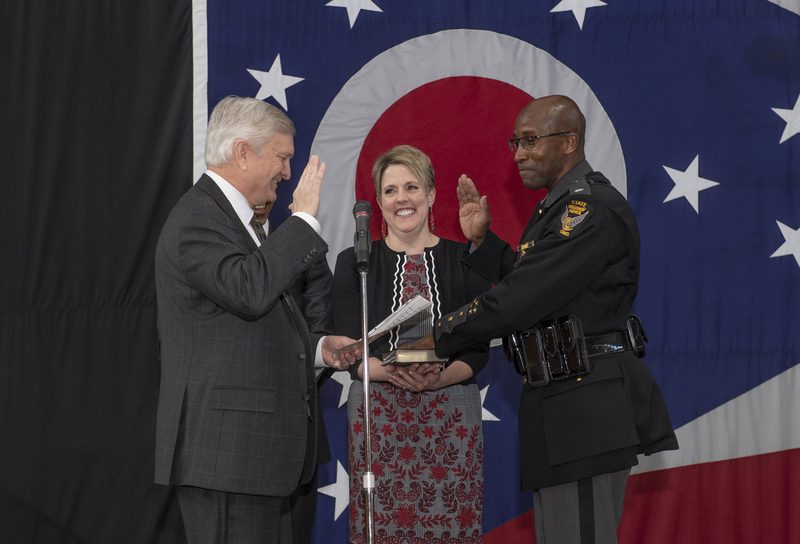 Lt. Col. Rick Fambro will soon assume the responsibilities of the superintendent of the Ohio State Highway Patrol and will be promoted to the rank of colonel. More. 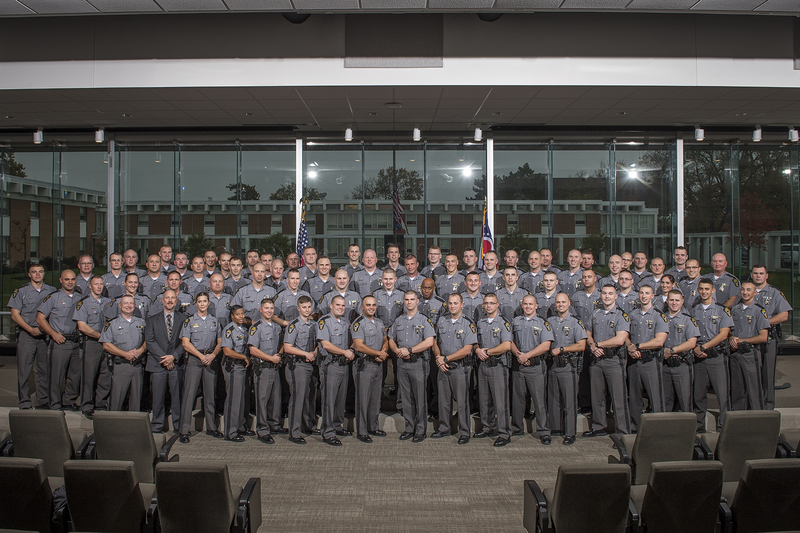 Please join us in congratulating the newly promoted members of the Ohio State Highway Patrol. Front row (L-R): Sergeant Corey W. Pennington, Sergeant Michael F. Hounshell, Sergeant Mark A. McFann, Sergeant Matthew A. Ruth, Sergeant James A. Boysel, and Sergeant Brandon A. Richardson. Back row (L-R): Lieutenant Kristin A. Welk, Lieutenant Geoffrey S. Freeman, Lieutenant Christopher S, Kelley, Lieutenant Bryan K. Mangin, Lieutenant Joel M. Smith, Lieutenant Dustin D. Neely, and Dispatch Supervisor Jacquelyn S. Martin. Not pictured: Captain Scott M. Demmitt. Ohio State Highway Patrol troopers filed felony drug charges against two Rhode Island men after a traffic stop in Muskingum County. 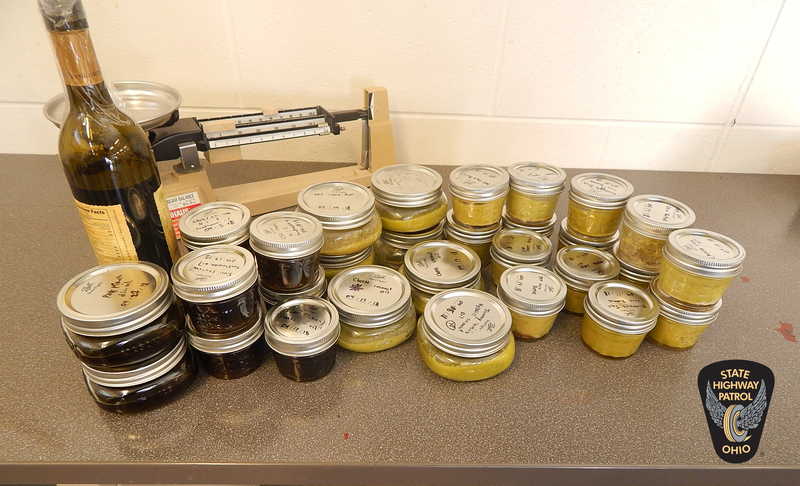 During the traffic stop, troopers seized 7,040 liquid ounces of CBD oil worth approximately $165,000. Read More. The passenger dialed #677 on her husband&apos;s phone to reach an OSHP dispatcher and then used her own cell phone to record the swerving semi. More. Ohio State Highway Patrol troopers filed felony drug charges against an Ohio woman after a traffic stop in Cuyahoga County. 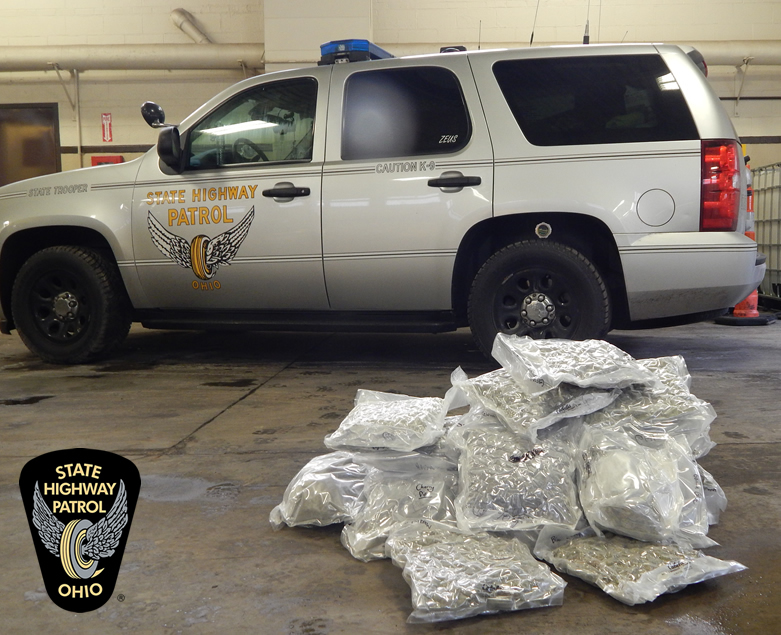 During the traffic stop, troopers seized 60 pounds of marijuana worth approximately $84,000. Read More. 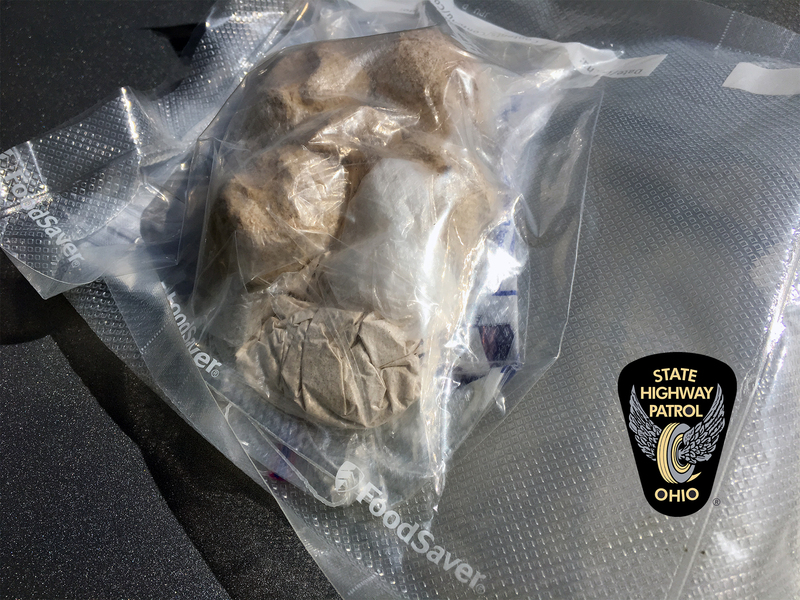 Ohio State Highway Patrol troopers filed felony drug charges against a Michigan man and woman after a traffic stop in Wood County. 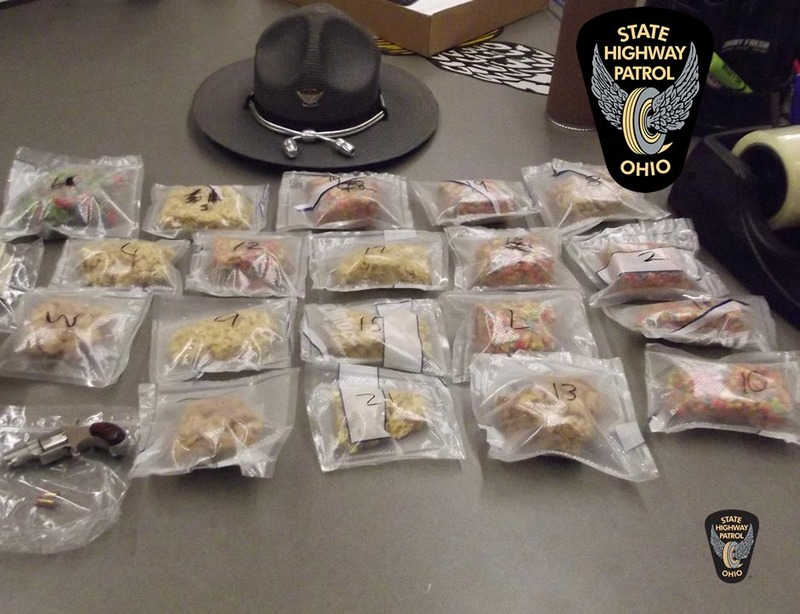 During the traffic stop, troopers seized more than 9 pounds of marijuana edibles, 26 mason jars of THC Kool-Aid, 92 THC vape cartridges, and 15 grams of hashish wax worth $27,500. Read More. 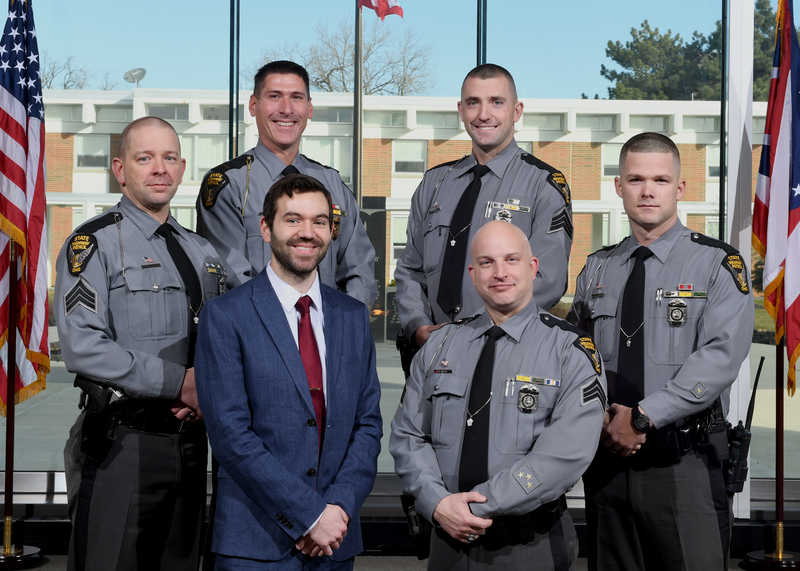 The Ohio State Highway Patrol announced the recipients of their 2018 Leadership Awards today. More. Ohio State Highway Patrol troopers filed felony drug charges against two Florida men after a traffic stop in Wood County. During the traffic stop, troopers seized more than 4 pounds of cocaine worth $84,000 and a loaded .380 handgun. Read More. Ohio State Highway Patrol troopers filed felony drug charges against a Colorado man after a traffic stop in Summit County. 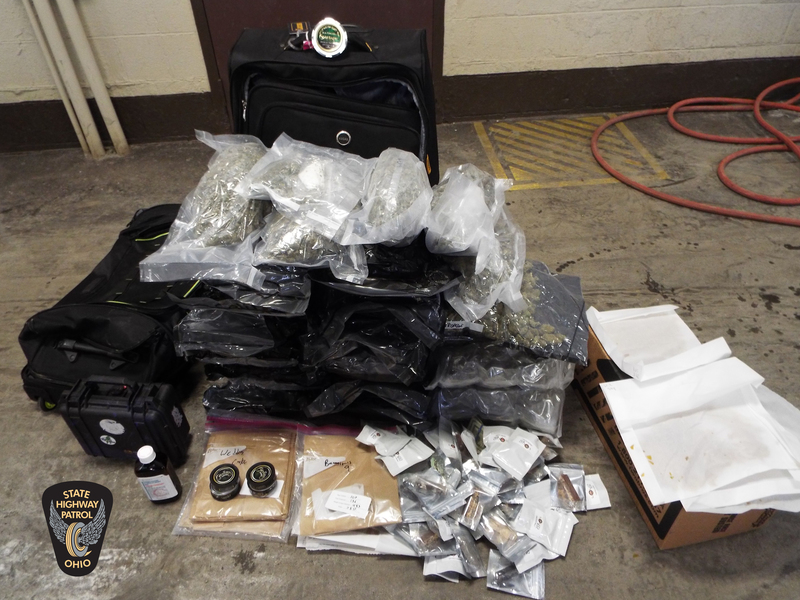 During the traffic stop, troopers seized 14 pounds of marijuana and marijuana edibles, 10 grams of solid hash and 16 grams of hash oil worth approximately $37,000. Read More. The suspect and victim in yesterday&apos;s abduction from the Ohio State University Mansfield campus have been located in Kentucky. More. Super Bowl Sunday is historically a day when friends and family gather. The Ohio State Highway Patrol is urging fans to be safe this Sunday by refraining from driving while impaired. More. Graduates include: K9 Cheri with Deputy Tylun Campbell from the Meigs County Sheriff&apos;s Office, K9 Katie with Trooper Jessie J. Johnson from the Warren District and K9 Thunder with Deputy Gary Waldron from the Gallia County Sheriff&apos;s Office. Ohio State Highway Patrol troopers filed felony drug charges against a Florida man after a traffic stop in Summit County. 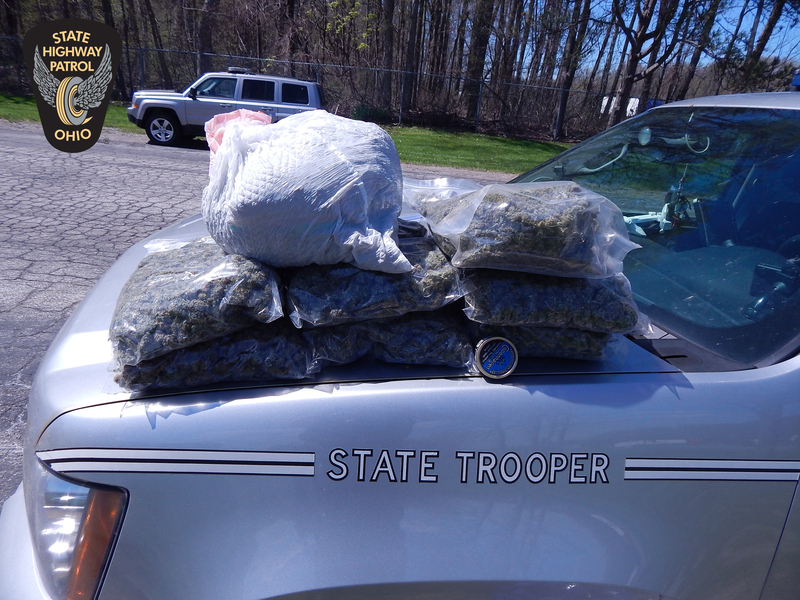 During the traffic stop, troopers seized 25 pounds of marijuana worth approximately $75,000. Read More. UPDATE: The Ohio State Highway Patrol is investigating a helicopter crash in Vinton County. The helicopter had three people on board at the time of the crash and all were pronounced dead at the scene. More. In an effort to reduce the leading cause of death in Delaware County teens, the SAFE Delaware County Coalition along with supporting partners have rallied together to launch a new high school prevention portal aimed at promoting and incentivizing safe-driving activities in high schools throughout Delaware County. More. Ohio State Highway Patrol troopers filed felony drug charges against an Ohio man after a traffic stop in Hancock County. During the traffic stop, troopers seized 18 grams of methamphetamine, 374 grams of marijuana and 13 grams of hashish worth $4,627 along with a 9mm handgun. Read More. Ohio State Highway Patrol troopers filed felony drug charges against a Nevada man after a traffic stop in Summit County. During the traffic stop, troopers seized 90 pounds of marijuana and 806 grams of hash oil worth approximately $276,600. Read More. The Ohio State Highway Patrol is teaming up with others to fight human trafficking. More. 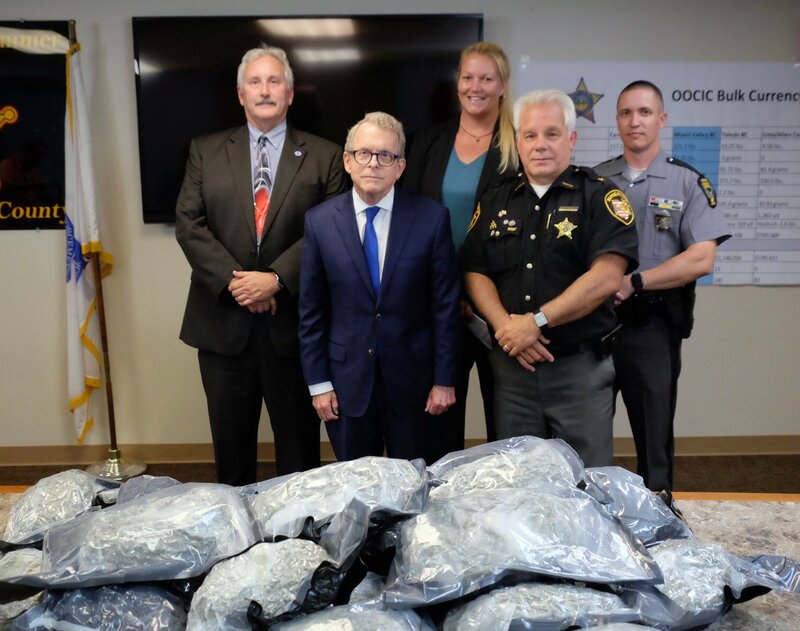 Scioto County Sheriff Marty V. Donini and Portsmouth Police Chief Robert Ware announce that two Portsmouth residents along with a Dayton, Ohio man were arrested on drug charges during a multiple agency operation that occurred on Thursday. More. The Ohio State Highway Patrol is collaborating with the Illinois State Police, Indiana State Police, Michigan State Police and Truckers Against Trafficking to raise awareness about human trafficking. More. Ohio State Highway Patrol troopers filed felony drug charges against an Ohio man after a traffic stop in Summit County. During the traffic stop, troopers seized 1 pound of methamphetamine and 30 grams of cocaine worth approximately $40,000. Read More. 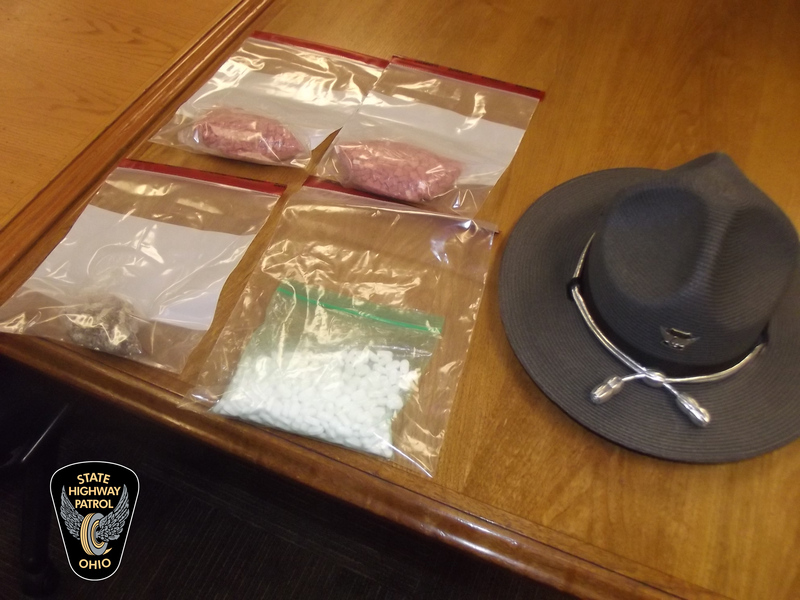 Ohio State Highway Patrol troopers filed felony drug charges against an Ohio man after a traffic stop in Athens County. During the traffic stop, troopers seized 84 grams of methamphetamine, 27 grams of cocaine and 11 grams of marijuana worth approximately $12,000. Read More. Ohio State Highway Patrol troopers filed felony charges against a Tennessee man after a traffic stop in Miami County. During the traffic stop, troopers seized $5,400 worth of counterfeit bills. Read More. The state Highway Patrol reminds drivers to winterize their vehicles and follow safe driving tips in preparation for inclement weather. More. 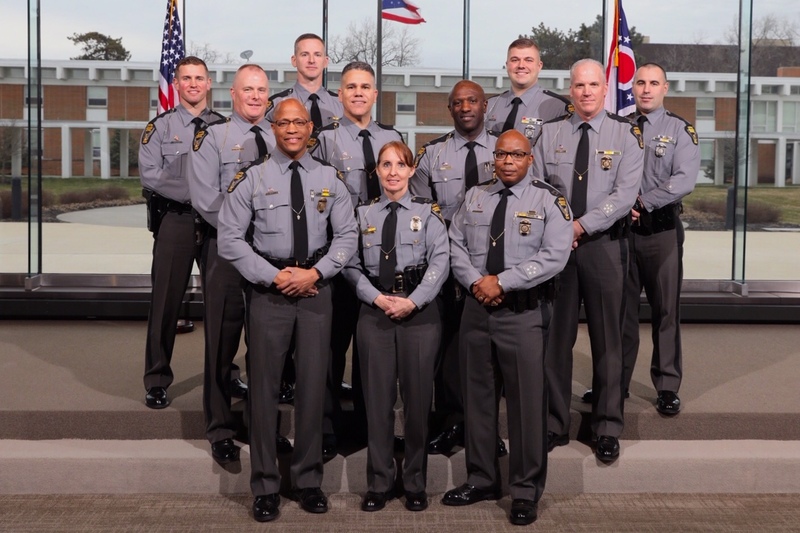 Please join us in congratulating the newly promoted members of the Ohio State Highway Patrol. Front row (L-R): Sergeant Juan &apos;Ray&apos; Santiago, Sergeant Shane M. Morrow. Middle row (L-R): Staff Lieutenant Jacob D. Pyles, Captain Cassandra L. Brewster and Sergeant Jeff D. Madden. Back row (L-R): Sergeant Keith G. Smith and Sergeant Robert J. Simone. Not Pictured: Ohio Investigative Unit Assistant Agent-in-Charge Andrew F. Alanis. A man accused of driving drunk and killing a family of four in an October crash was indicted Tuesday by an Ashtabula County grand jury. More. Ohio State Highway Patrol troopers filed felony drug charges against a Virginia man after a traffic stop in Sandusky County. During the traffic stop, troopers seized 10 pounds of marijuana and 4 ounces of THC shatter/wax worth approximately $29,348. Read More. Held annually in mid-December, 12 Kids of Christmas is when Toledo police officers and local military members team up with needy children to eat, bond, shop, and visit with Santa. More. 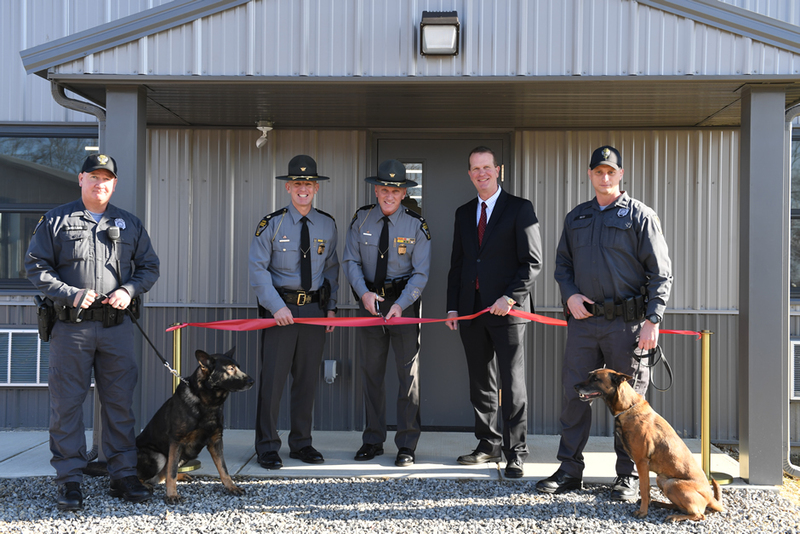 Earlier today, the Ohio State Highway Patrol formally opened its Canine Training Facility. 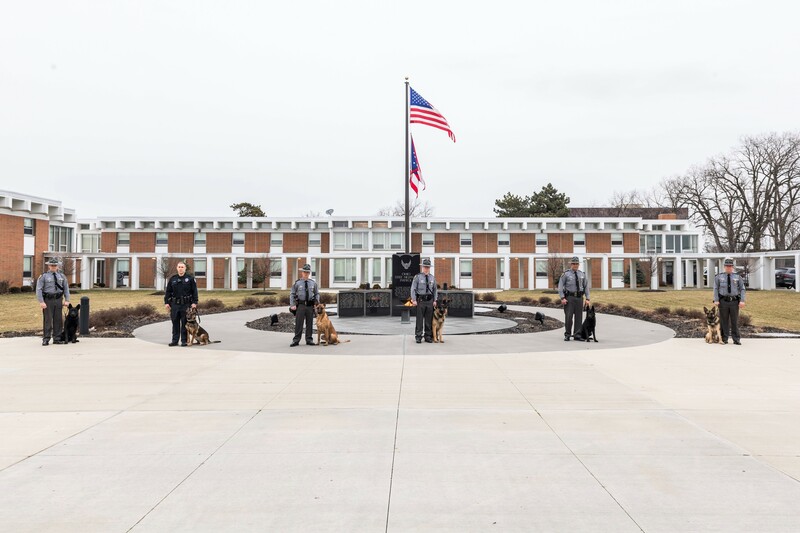 The new facility is located in a centralized location for the Patrol's canine operations and training programs. Read More. Ohio State Highway Patrol troopers filed felony drug charges against an Ohio man after a traffic stop in Preble County. During the traffic stop, troopers seized a stolen .40 caliber handgun and three pounds of marijuana valued at approximately $6,249. Read More. With December being one of the busiest months of the year, the Ohio State Highway Patrol is committed to getting impaired drivers off the roadways. More. Keeping drugged and drunk drivers off the road is of course a year-round effort. More. Why Does It Take So Long To Open A Road After An Accident? 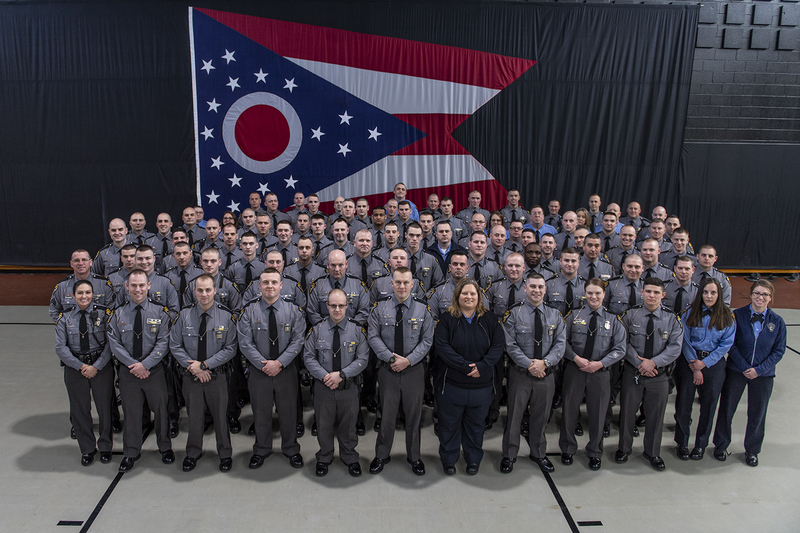 The Ohio State Highway Patrol has 14 reconstructionists located across the state. More. Ohio State Highway Patrol troopers filed felony drug charges against two Ohio men after a traffic stop in Ashland County. During the traffic stop, troopers seized 1,899 grams of Oxycodone/Hydrochloride pills and marijuana valued at approximately $20,000. Read More. 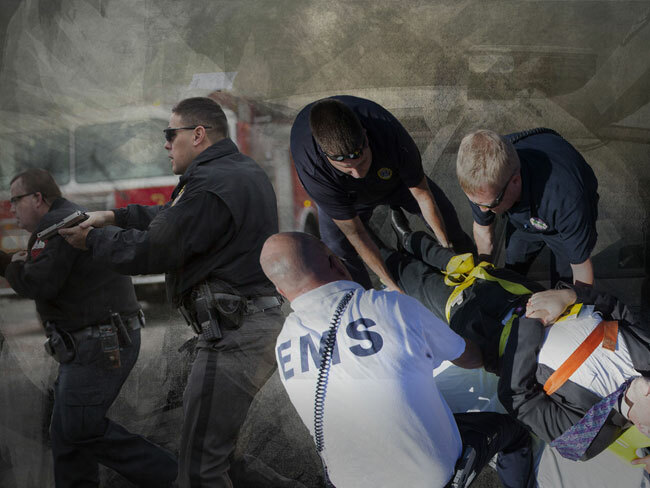 The Ohio State Highway Patrol remains committed to removing impaired drivers from Ohio&apos;s roads before senseless tragedies occur. More. Ohio State Highway Patrol troopers filed felony drug charges against three Ohio men and one woman after a traffic stop in Guernsey County. During the traffic stop, troopers seized 47 grams of cocaine, 17 grams of crack and 7 grams of heroin valued at approximately $6,500. Read More. As the holiday season gets into full swing, police and safety advocates have a grim reminder of what can happen when party-goers take to the road after having too much to drink. More. 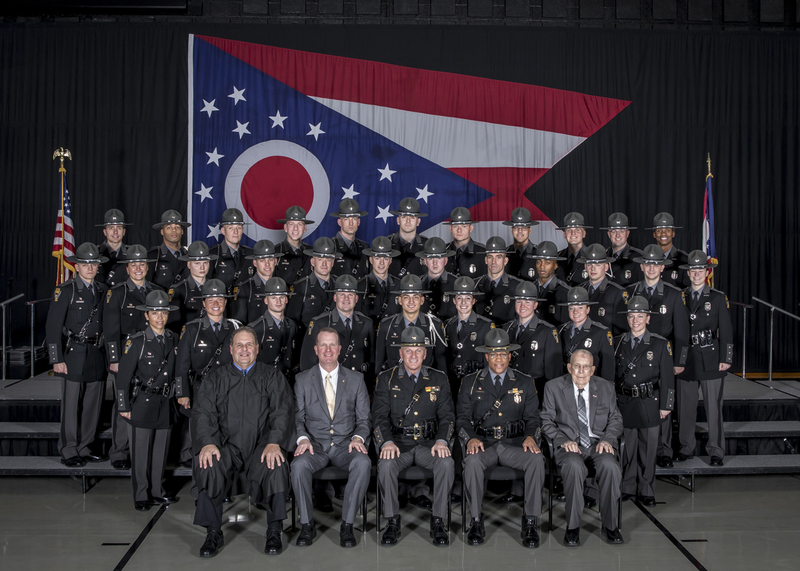 Today, 32 new troopers officially joined the Ohio State Highway Patrol. Congratulations to the #164Class. More. Ohio State Highway Patrol troopers filed felony drug charges against a California man after a traffic stop in Wood County. 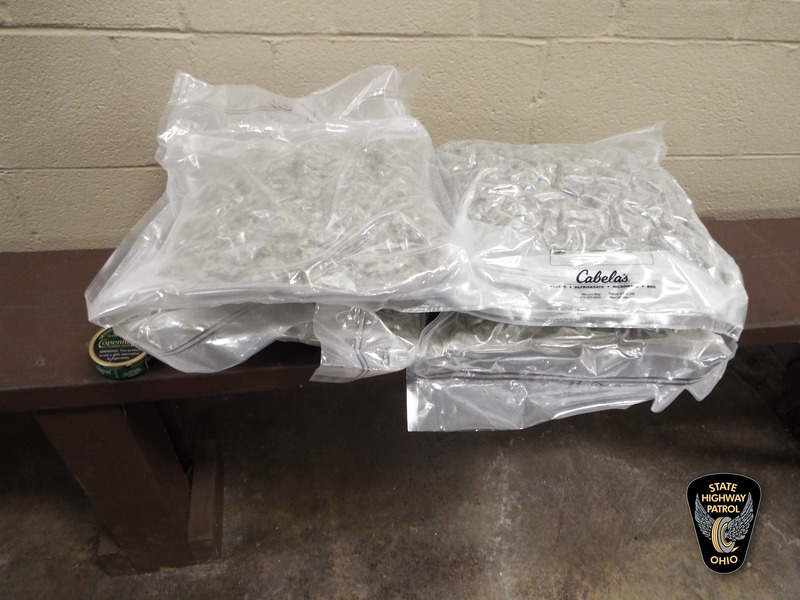 During the traffic stop, troopers seized 101 pounds of marijuana valued at approximately $235,835. Read More. Ohio State Highway Patrol troopers filed felony drug charges against two women — one from Ohio and one from New York — after a traffic stop in Wood County. 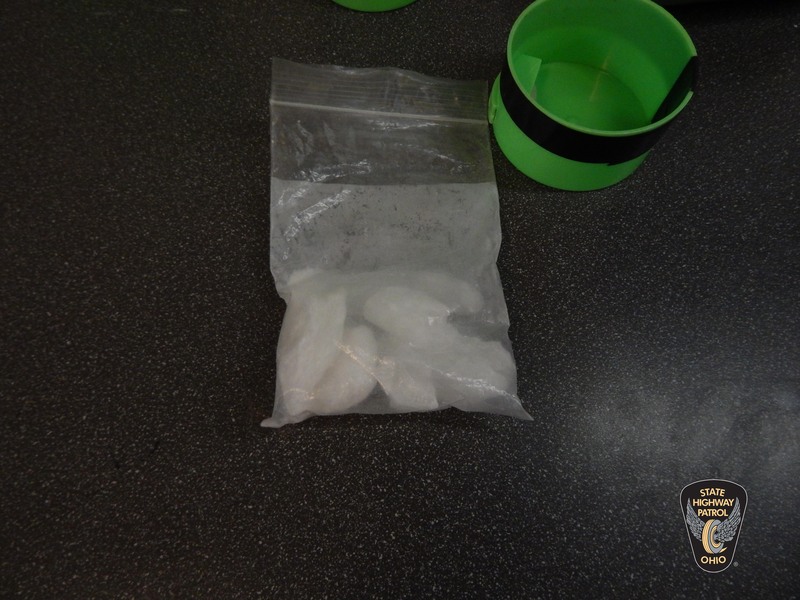 During the traffic stop, troopers seized 50 grams of methamphetamine valued at approximately $5,000. Read More. A suspect involved with a forceful robbery and carjacking in Cleveland was taken into custody overnight. More. Provisional statistics released today show this Thanksgiving holiday travel season was the safest since 1991. More. 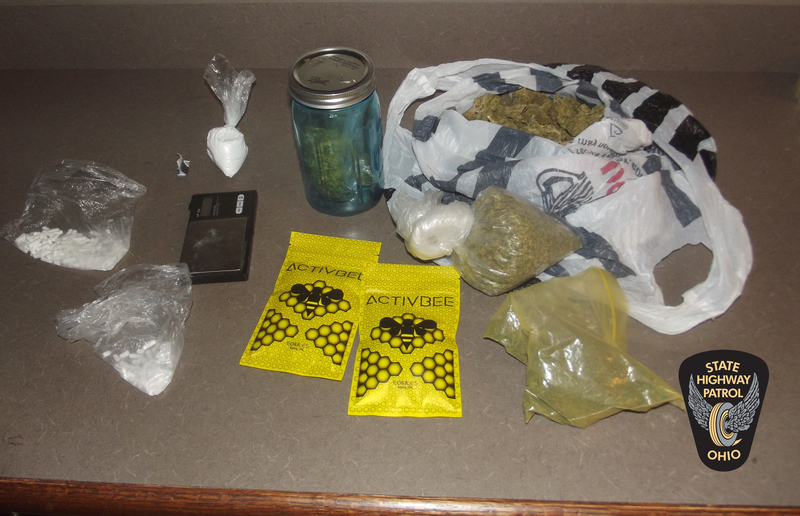 Ohio State Highway Patrol troopers filed felony drug charges against an Ohio man after a traffic stop in Wood County. During the traffic stop, troopers seized 693 Oxycodone pills and marijuana valued at approximately $23,640. Read More. For the second year in a row, AAA is predicting the highest Thanksgiving travel numbers in a decade. More. Troopers have been riding on school buses in the mornings and afternoons and have also been driving behind buses throughout the bus routes. More. Ohio State Highway Patrol troopers filed felony drug charges against a California man after a traffic stop in Madison County. During the traffic stop, troopers seized 250 pounds of marijuana valued at approximately $1.2 million. Read More. Ohio State Highway Patrol troopers filed felony drug charges against two Ohio men after a traffic stop in Delaware County. During the traffic stop, troopers seized 1 pound of methamphetamine, 4 Suboxone pills and drug paraphernalia valued at approximately $10,000. Read More. Thanksgiving Eve is one of the biggest party nights of the year, but local law enforcement is urging people to think before you drink. More. 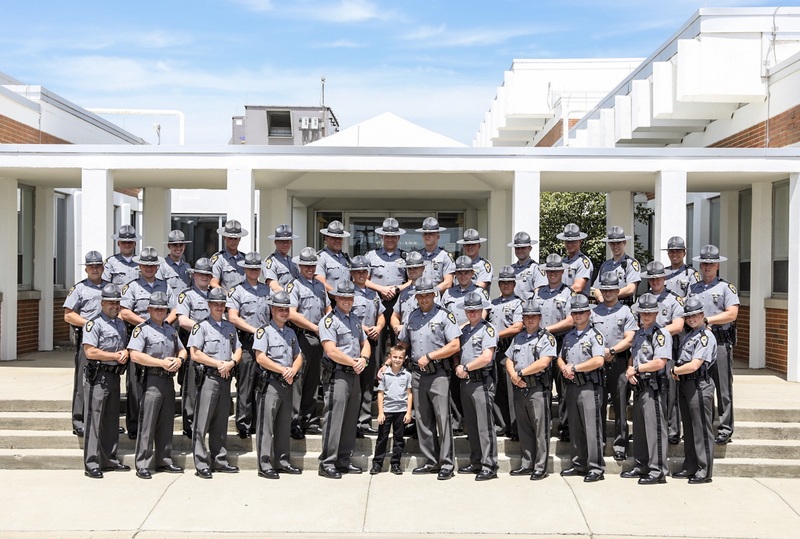 The Ohio State Highway Patrol today celebrates 85 years of service. More. The Ohio State Highway Patrol post assisted 28 crashes at just 4:30 p.m. Thursday. One of those a fatal accident and another injuring a trooper of their own. More. Ohio State Highway Patrol troopers filed felony drug charges against a Michigan man after a traffic stop in Shelby County. During the traffic stop, troopers seized a .40 caliber handgun and 20 pounds of marijuana, 1 pound of hashish and 11 oxycodone pills valued at approximately $74,280. Read More. Ohio State Highway Patrol troopers filed felony drug charges against a California woman after a traffic stop in Cuyahoga County. During the traffic stop, troopers seized 510 pounds of marijuana valued at approximately $1.3 million. Read More. A trooper with the Ohio Highway Patrol pulled over an SUV as it drove down the road with sparks flying from a wheel. What the trooper didn&apos;t realize at the time, the driver was a suspect in a murder that happened nearby just minutes earlier. More. With the holidays approaching and the road getting busier, law enforcement agencies are taking extra precautions to keep you and your family safe. More. 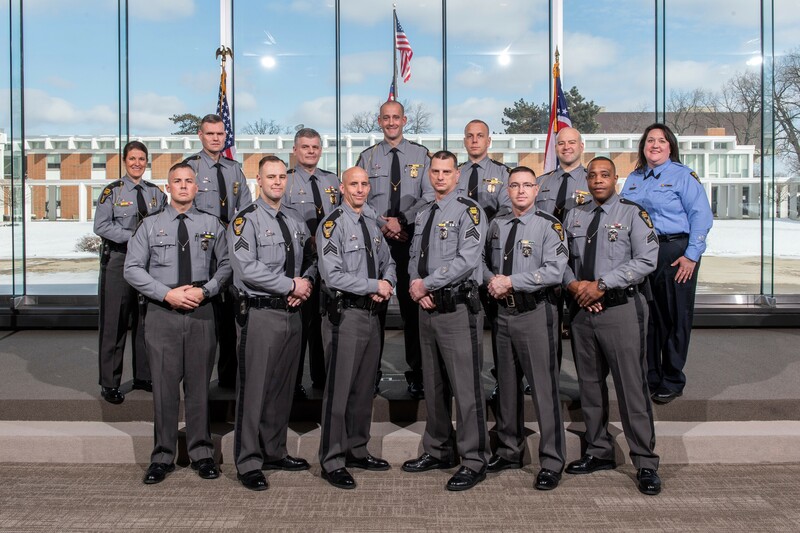 Please join us in congratulating the newly promoted members of the Ohio State Highway Patrol. Front row (L-R): Lieutenant Merrill J. Thompson and Sergeant Dustin Hamilton. 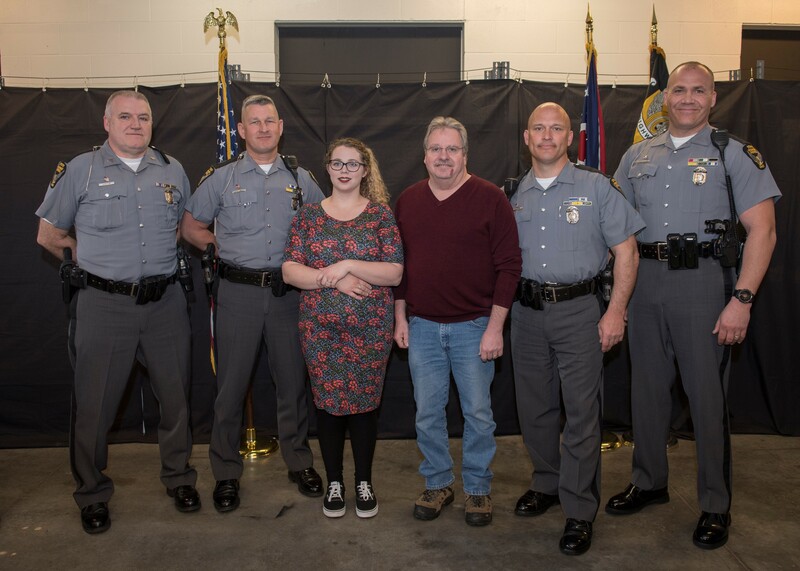 Back row (L-R): GIMS System Administrator Christine L. Phillips; Sergeant David G. Slanker; Administrative Officer 3 Jonathan S. Heil and Sergeant Kaitlyn M. Kowicki. Trooper Craig B. Overly was honored at the 2018 U.S. Attorney&apos;s Law Enforcement & Victim Assistance Awards Ceremony hosted by the U.S. Attorney&apos;s Office for the Southern District of West Virginia on October 25, 2018. Earlier this year, he stopped a car for speeding and detected an odor of marijuana coming from the vehicle. A probable cause search revealed marijuana and 200 grams of a heroin/fentanyl compound mixture. The suspects were found to be part of a large drug trafficking organization being investigated by the DEA. The drug trafficking organization was subsequently dismantled in April. More information about the investigation can be found here. 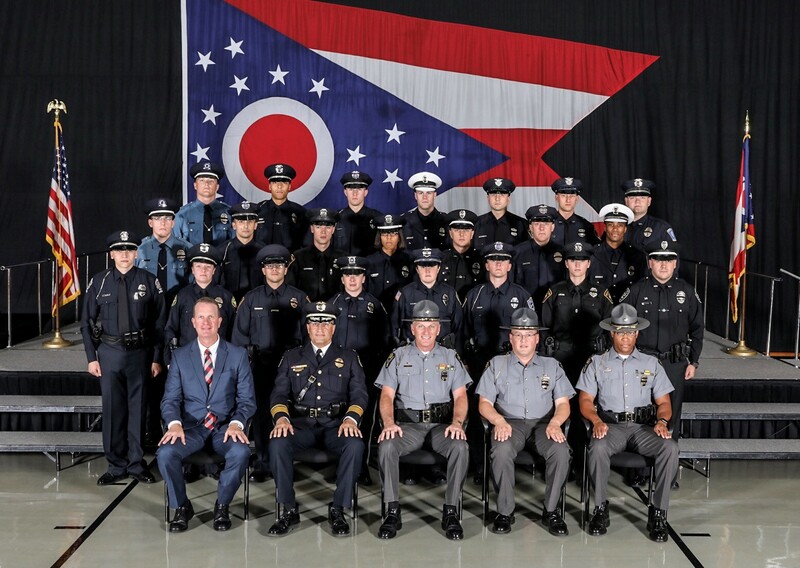 These troopers worked diligently to look "beyond the plate" in order to remove drugs from Ohio communities and return stolen vehicles to their rightful owners. House Bill 95 became law Oct. 29, establishing Ohio&apos;s approach of combating distracted driving by enhancing existing moving violations. More. The Ohio State Highway Patrol has offered safety tips in advance of Halloween activities, in an effort to remind pedestrians and motorists that "pedestrian safety is a shared responsibility." More. Congratulations to the 2018 Law Enforcement Awards recipients. 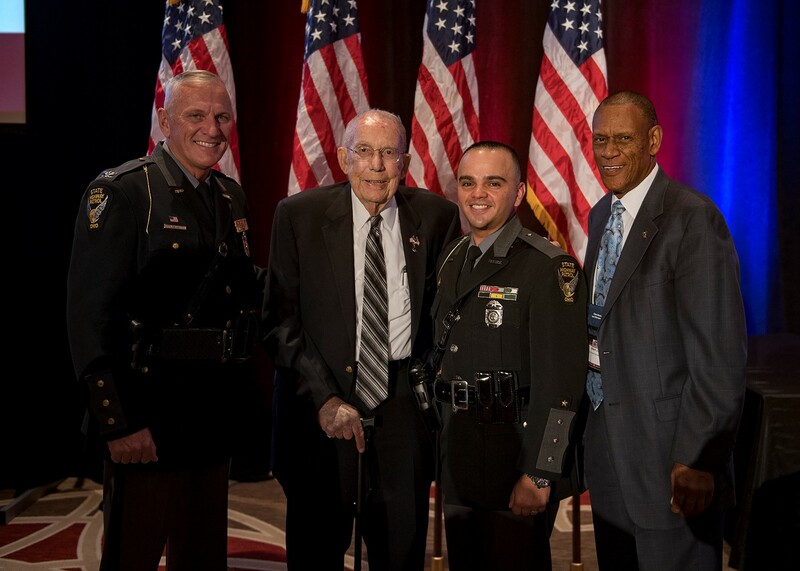 OSHP Chaplain Reverend Richard D. Ellsworth, recipient of the Ohio Distinguished Law Enforcement Civilian Leadership Award; Trooper Juan "Ray" Santiago, recipient of the Community Service Award and retired OSHP Lieutenant Colonel Gilbert H. Jones, recipient of the Ohio Distinguished Law Enforcement Lifetime Achievement Award. They were joined by Colonel Paul A. Pride, superintendent. On October 26, troopers stopped a 2010 Lincoln Continental with Michigan registration for a license plate light violation on Interstate 75 in Hancock County. 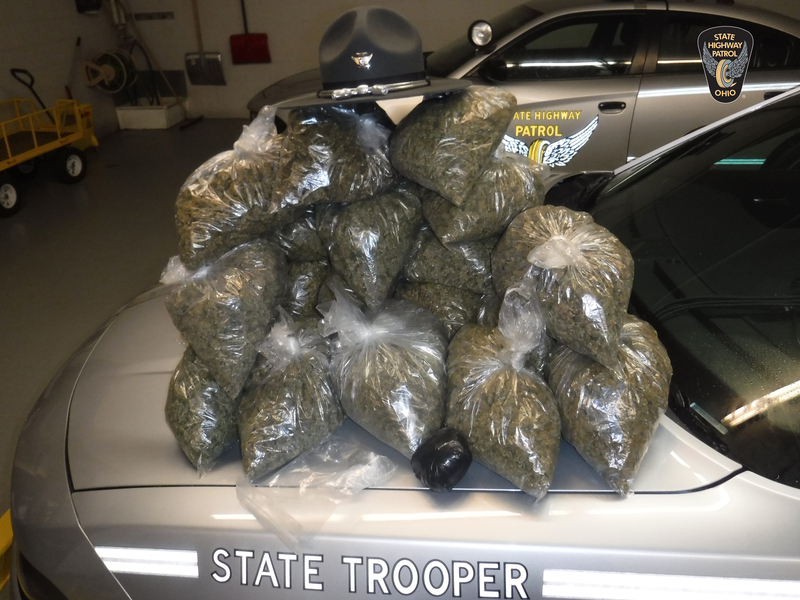 During interaction with the occupants, troopers detected an odor of raw marijuana coming from the vehicle. A probable cause search revealed a scale, 13 pounds of marijuana and 22 vials of THC oil worth $32,355. The driver, Sidney Starr Harris, 76, of Pontiac, Mich., and passenger, James Gregory Evans, Jr., 48, of Detroit, were charged with possession of marijuana, a third-degree felony. Both were incarcerated in the Hancock County Justice Center. Ohio State Highway Patrol troopers filed felony drug charges against two West Virginia women after a traffic stop in Hancock County. During the traffic stop, troopers seized 392 grams of heroin valued at approximately $69,776. Read More. National Teen Driver Safety Week continues through Oct. 27, and Ohio Department of Insurance and the Ohio Department of Public Safety including the Ohio State Highway Patrol, encourage all parents not to hand over the keys until their teens know the rules of the road. More. Ohio State Highway Patrol troopers at the Swanton Post have located an Indian tourist who went missing from New York. More. As part of National School Bus Safety Week, which is October 21 to 26, buses not only had their driver on board, but also a state trooper. More. COLUMBUS – The Ohio State Highway Patrol joined forces with members of the 6-State Trooper Project to focus on speed, safety belt and OVI enforcement on Interstate 70. More. S.A.L.T. Council members were recently presented with certificates from Ohio Attorney General Mike DeWine's Office for five or more years of service in the S.A.L.T. Council. More. The Ohio Department of Transportation and Ohio State Highway Patrol are launching a new Safety Corridor along state Route 18 in Medina County. More. The Ohio State Highway Patrol is announcing a pair of new driving enforcement measures, and one of them starts next week. More. Four Ashtabula men face felony drug charges stemming from a multi-agency, two-day operation that resulted in the seizure of heroin, fentanyl, cash and more. More. The Ohio State Highway Patrol conducts about 6,000 motor coach inspections each year, including limousines and party buses. More. In Ohio from 2015 to 2017, teen drivers were involved in 135, 882 traffic crashes and 15 percent of those crashes contributed to an action on the part of the teen driver, according to a release. More. On October 1, 2018, troopers stopped a 2017 Nissan Altima with Michigan registration for an improper lane change violation on Interstate 75 in Miami County. During interaction with the driver, troopers detected an odor of burnt marijuana coming from the vehicle. A probable cause search revealed two bags containing more than 3 pounds of hydroponic marijuana and cocaine on her person. The contraband has an approximate street value of $9,542. The driver, Mary F. Pezzoni, 43, of Howell, Mich., was charged with possession of marijuana and cocaine, both third-degree felonies; and possession of criminal tools, a fifth-degree felony. Pezzoni was incarcerated in the Miami County Jail. Ohio State Highway Patrol troopers filed felony drug charges against a California man after a traffic stop in Madison County. 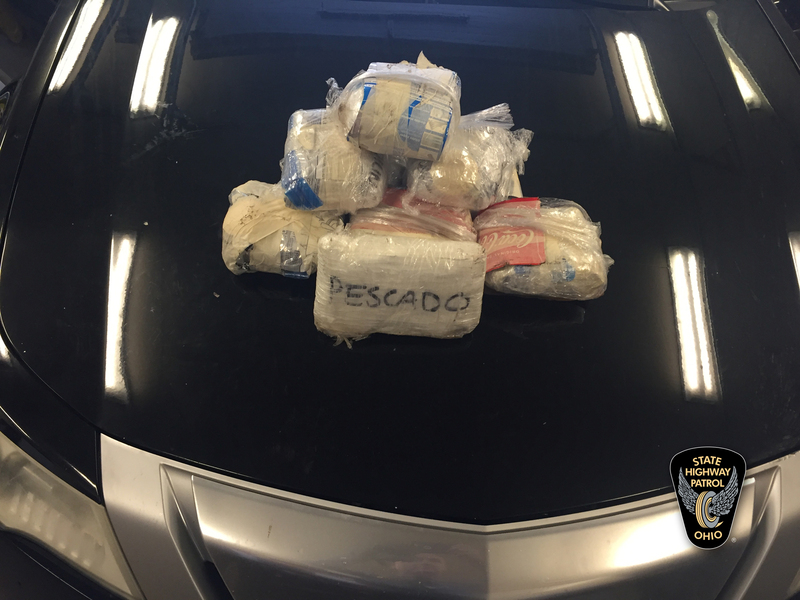 During the traffic stop, troopers seized more than 4 pounds of heroin valued at approximately $800,000. Read More. On October 1, 2018, troopers stopped a 2014 Mitsubishi Outlander with Tennessee registration for marked lanes and speed violations on Interstate 75 in Hancock County. During interaction with the occupants, troopers detected an odor of raw marijuana coming from the vehicle. A probable cause search revealed two cardboard boxes containing 5 pounds of marijuana, cocaine and a loaded handgun. The contraband has an approximate street value of $12,500. The driver, Denzell Price, 23, and passenger, Kennedy Greene, 22, of Knoxville, Tenn., were charged with possession of marijuana, a third-degree felony. Price was also charged with having weapons under disability, a third-degree felony; carrying concealed weapon, a fourth-degree felony; and possession of cocaine, a fifth-degree felony. Both were incarcerated in the Hancock County Jail. Ohio State Highway Patrol troopers filed felony drug charges against two Ohio men after a traffic stop in Summit County. 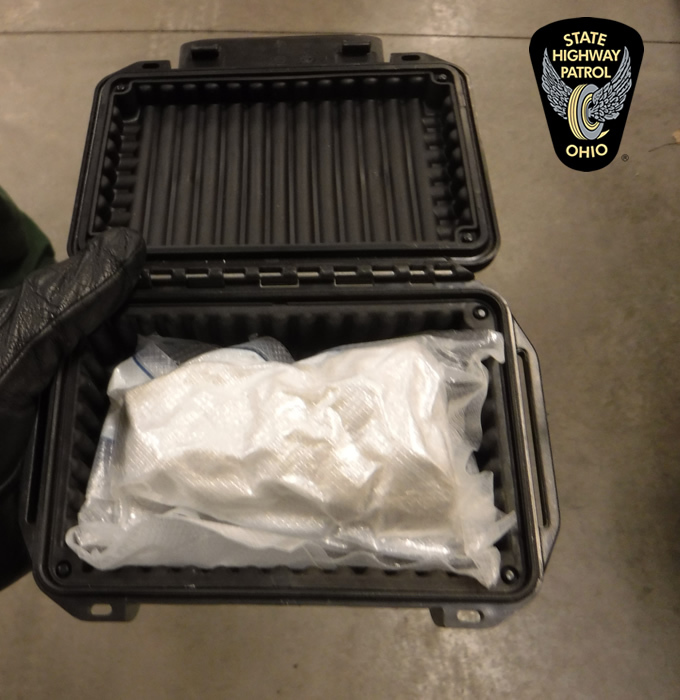 During the traffic stop, troopers seized 5 pounds of cocaine valued at approximately $91,000. Read More. Ohio State Highway Patrol troopers filed felony drug charges against an Ohio man after a traffic stop in Lorain County. During the traffic stop, troopers seized a Taurus 9mm handgun and 58 grams of methamphetamine valued at approximately $4,582. Read More. An organized open-carry walk quickly turned into a chaotic standoff between Olson and Bowman Halls as counterprotestors, gun rights activists and hundreds of police clashed. More. Columbus Police, the Ohio Department of Transportation and the Ohio State Highway Patrol has launched a joint crash reduction effort. More. Prescription opioid-related overdose deaths are at an eight-year low and heroin-related overdose deaths are at a four-year low, according to a new Ohio Department of Health report. More. Ohio State Highway Patrol troopers filed felony drug charges against two men after a traffic stop in Wood County. During the traffic stop, troopers seized 140 grams of cocaine valued at approximately $12,740. Read More. A man on the run after allegedly slashing his wife's throat was sitting in jail Saturday. Raymond Roberts was caught by a Highway Patrol trooper in Springfield Saturday morning. More. Fugitive Shawn Christy was captured at 4:38 p.m. Friday, bringing a massive five-day manhunt to an end. More. Law enforcement from 17 states across the Midwest and the federal Drug Enforcement Agency are coming together to discuss drug interdiction and the "battle against illicit drugs." More. 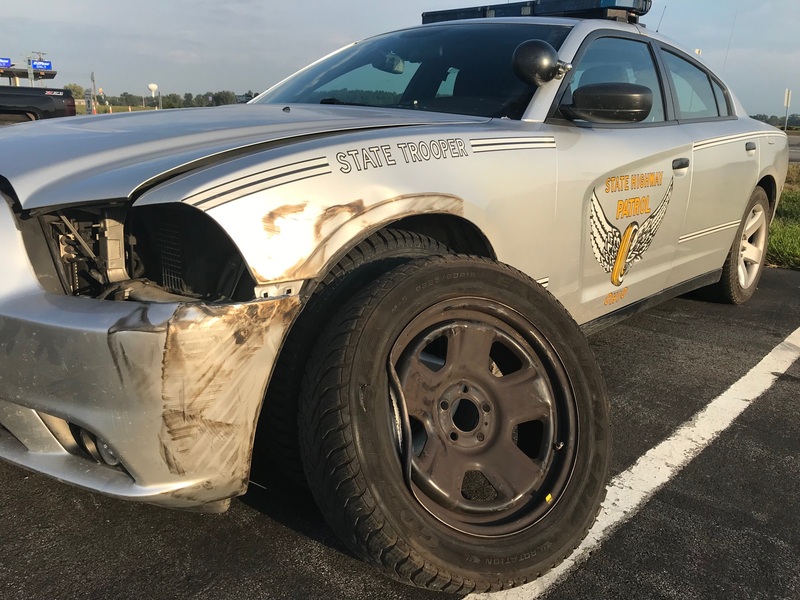 The Ohio State Highway Patrol is asking the public for assistance in locating or identifying a commercial vehicle that struck a Patrol cruiser and fled on the Ohio Turnpike early this morning. Read More. Eight people from Akron were indicted in federal court for their roles in a conspiracy to traffic methamphetamine and heroin. More. Portage County Juvenile Court, with the assistance of the Ohio State University Extension Office of Portage County and the Ohio State Highway Patrol, works with juveniles who commit either waiverable traffic offenses or, in some cases, non-waiverable offenses. More. A state trooper pulled an unconscious driver from a van that crashed and caught fire on Interstate 75 North near Troy Monday afternoon, according to investigators. More. 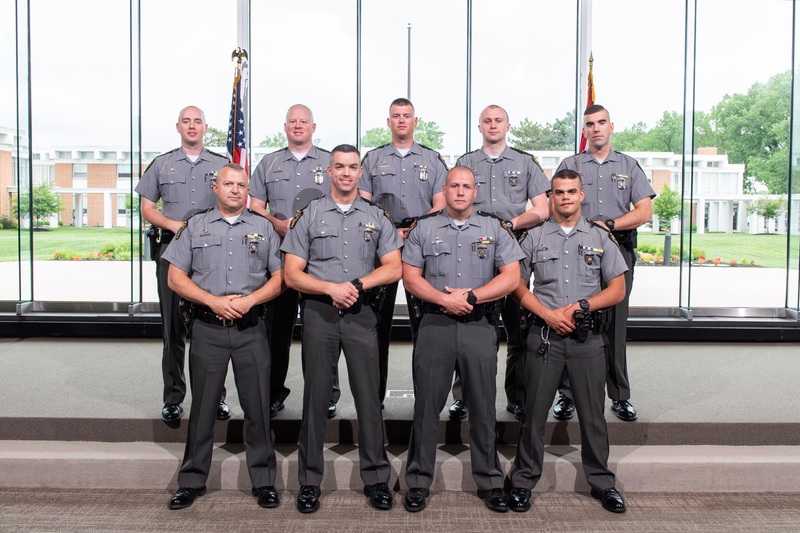 Please join us in congratulating the newly promoted members of the Ohio State Highway Patrol. Front row (L-R): Sergeant Brian K. Spackey and Lieutenant Brian M. Vail. Back row (L-R) Lieutenant Nicholas A. Lunsford; Staff Lieutenant Karla M. Taulbee; Auxiliary Lieutenant Colonel W. Jason Sanford, Auxiliary commander; Sergeant Evan D. Mace and Sergeant James C. Belcher. 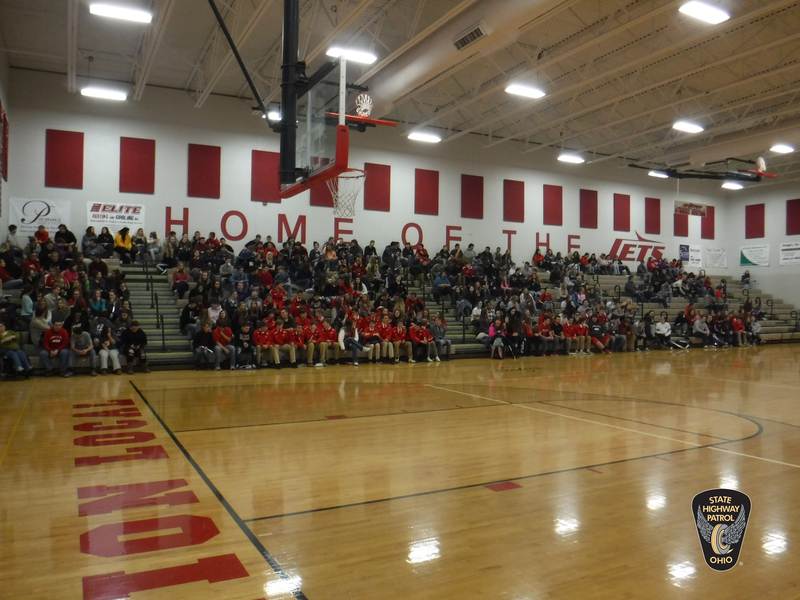 The Ohio State Highway Patrol, local business owners and Steubenville High School students on Friday kicked off the patrol&apos;s annual program urging drivers of all ages not to text while driving. More. Eleven people were indicted for their roles in a conspiracy to traffic large amounts of cocaine and methamphetamine from Texas to the Akron area. More. A trio of suspected jewelry store robbers gets caught in Botkins after a trooper spots their vehicle driving down I-75. More. Leaders from multiple public safety agencies took time during a Wednesday panel to say their work is strengthened by strong relationships with each other. More. 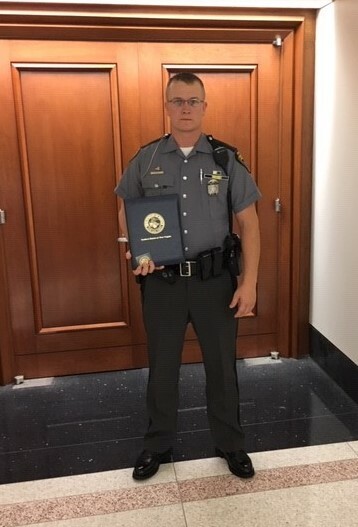 An Ohio State Highway Patrol trooper said he was just doing his job when he helped a stranded motorist get to a job interview on time. More. September is Safe Driving Awareness Month, and the Ohio State Highway Patrol is urging motorists to commit to driving buckled, focused and sober. More. Ohio State Highway Patrol troopers filed felony drug charges against an Ohio man after a traffic stop in Stark County. 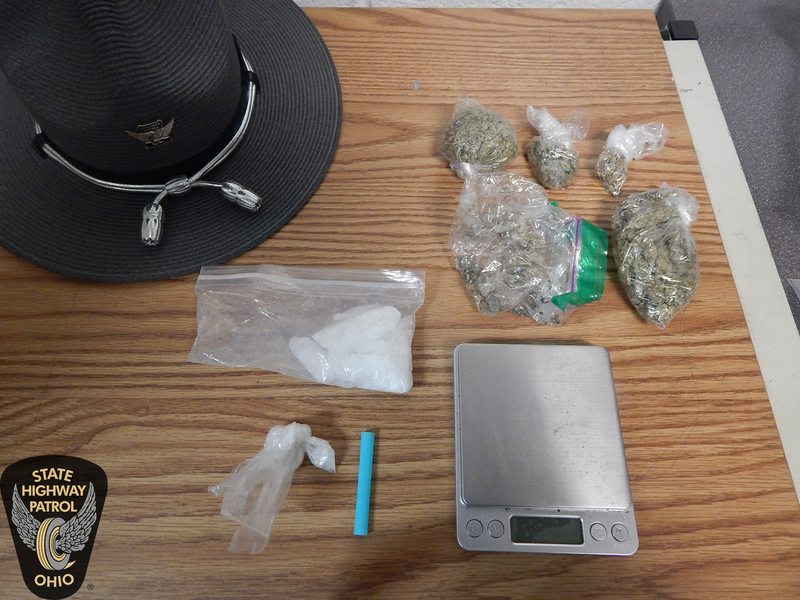 Troopers seized marijuana and 32 grams of cocaine valued at approximately $6,638. Read More. The Chillicothe police and area agencies teamed up for a week-long detail that netted narcotics, thousands in cash, and various arrests. More. Ohio state trooper Bradley Hess was one of the first emergency responders to arrive on the scene of a triple shooting Monday in the West End. His quick thinking might have helped save a victim's life. More. An attempted traffic stop in Miami County led to the arrest Monday afternoon of a Michigan man who is a suspected serial bank robber. More. 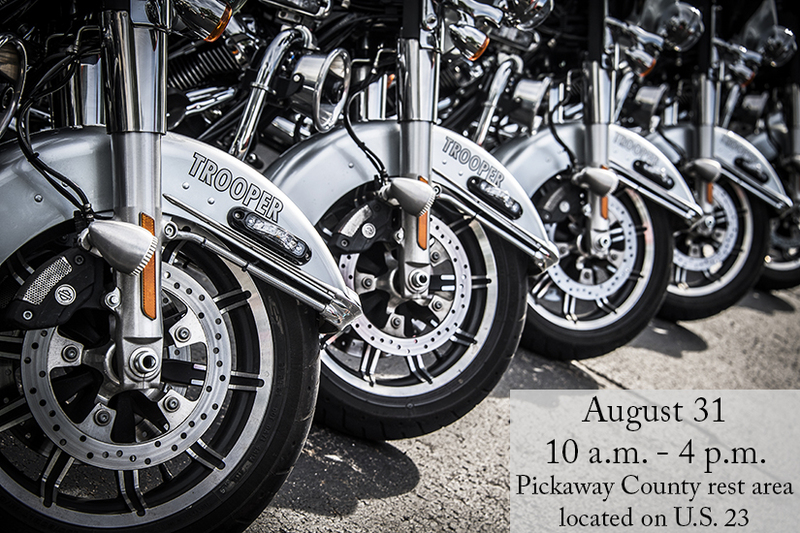 Come join us for a motorcycle safety event at the Pickaway County rest area located on U.S. 23 on August 31 from 10 a.m. - 4 p.m. Representatives will be available to speak about motorcycle maintenance and rider safety. For more information visit here. A mixture of heroin and fentanyl has been identified by the Ohio State Highway Patrol as the substance that caused an apparent overdose of one inmate and required medical attention for 27 staff members at the Ross Correctional Institution (RCI) in Chillicothe this morning. More. The Ohio State Highway Patrol is currently investigating a substance exposure at the Ross Correctional Institution (RCI) in Chillicothe. 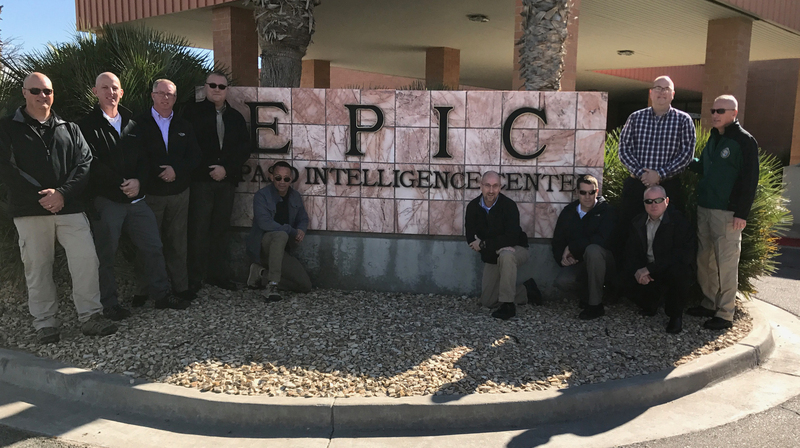 The facility is secure with no safety threat to the public. More. 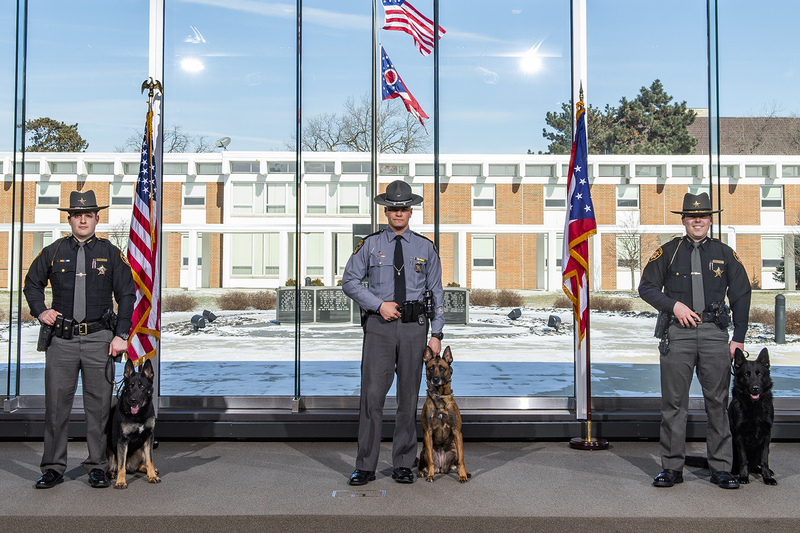 The Ohio State Highway Patrol&apos;s Lisbon Post hosted and coordinated a special detail for the K-9 team to set out on a joint venture to patrol the communities. More. The Ohio State Highway Patrol is out in force - not just on traffic stops but criminal interdiction. More. Ohio State Highway Patrol troopers filed felony drug charges against an Ohio man after a traffic stop in Ashtabula County. During the traffic stop, troopers seized more than 1 ounce of methamphetamine valued at approximately $3,434. Read More. 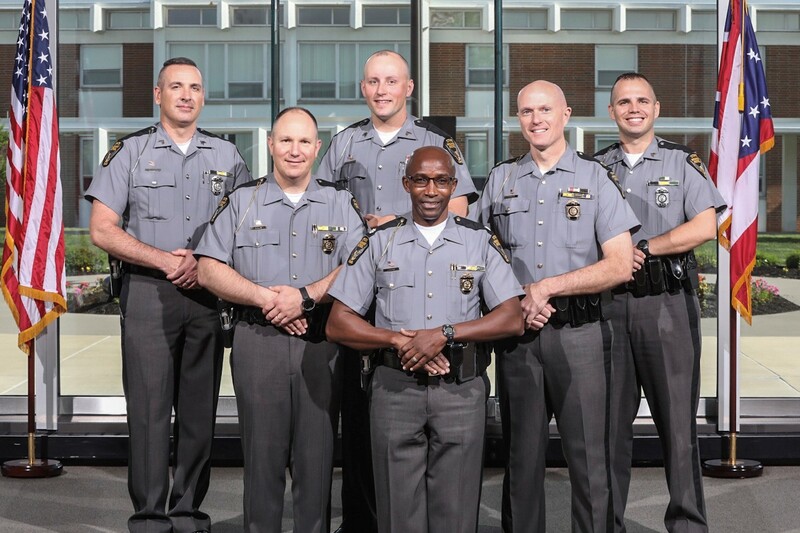 Ohio State Highway Patrol troopers save the life of a man getting ready to jump off a bridge on the Turnpike. More. Ohio State Highway Patrol Motor Carrier Enforcement Inspector Supervisor (MCES) Brian K. Wilson, Cleveland District, along with his team finished first place during the inspection competition. Read More. The Ohio Department of Public Safety and its State Highway Patrol are concerned with more than how fast cars and trucks are traveling on the state&apos;s freeways and limited-access roadways, and we&apos;re all better for it. More. The Ohio State Highway Patrol and Ohio Department of Transportation want motorists noticing and paying attention to the signs that were erected in April and identify the state&apos;s first "Distracted Driving Safety Corridor." More. Ohio State Highway Patrol troopers filed felony drug charges against an Ohio man after a traffic stop in Butler County. During the traffic stop, troopers seized two handguns and 70 grams of methamphetamine valued at approximately $7,070. Read More. The Indiana, Pennsylvania and Ohio State Highway Patrols are working with the Mahoning Valley Scrappers to try to stop distracted driving. More. Ohio State Highway Patrol troopers filed felony drug charges against a West Virginia man and woman after a traffic stop in Hancock County. During the traffic stop, troopers seized 246 grams of heroin and 1 gram of marijuana valued at approximately $43,788. Read More. Three New York men passing through the Buckeye State are accused of being involved in identity fraud after an Ohio Highway Patrol trooper found fake IDs and forged documents in their vehicle during a traffic stop. More. Hannah Manning was caught by Ohio State Highway Patrol troopers in Cleveland. More. As area students prepare to return to the classroom, big yellow buses will also be returning to local roadways. With the start of the school year comes the concern for school bus accidents. More. 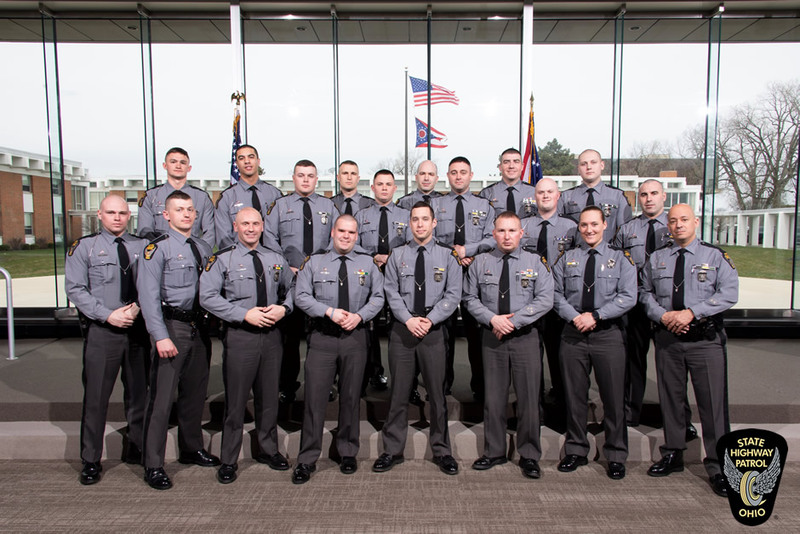 Please join us in congratulating the newly promoted members of the Ohio State Highway Patrol. 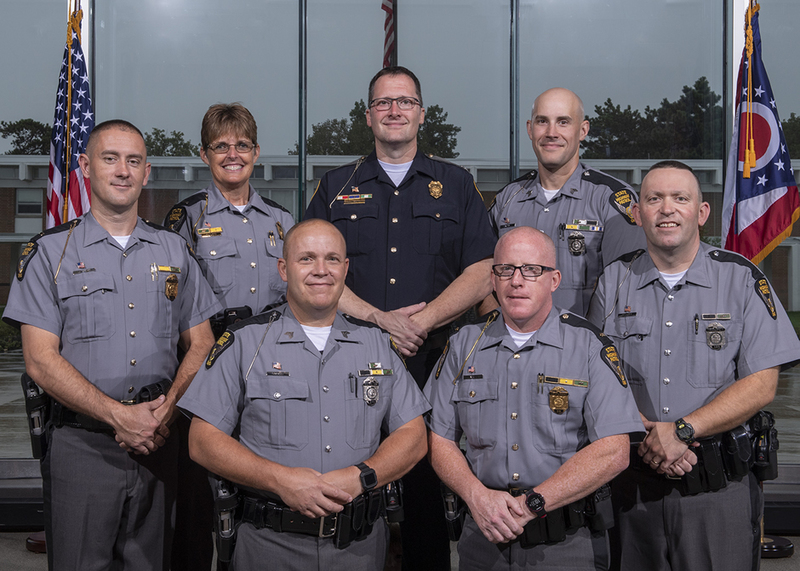 Back row (L-R): Motor Carrier Enforcement Inspector Brian K. Wilson, Sergeant Bradley P. Longo, Sergeant Michael J. Ross, Sergeant Shon L. Frost, Sergeant Chad E. Smith and Sergeant Kristi J. Comstock. Front row (L-R): Sergeant Luke C. Forshey, Lieutenant Philip J. Robinson, Staff Lieutenant James E. Tracy, Lieutenant Melanie R. Appleman and Lieutenant Scott J. Kuntz. The Ohio Assist program was created in March of 2016 in an effort to help public agencies all through the state. More. Ohio State Highway Patrol troopers filed felony drug charges against two Michigan men after a traffic stop in Gallia County. During the traffic stop, troopers seized 1,000 Oxycodone pills valued at approximately $40,000. Read More. 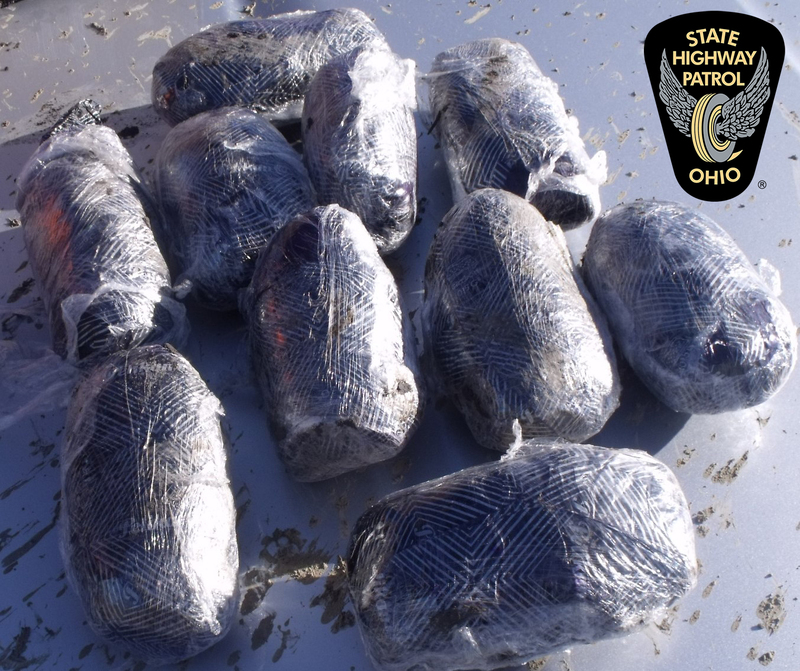 In 2013, the Ohio State Highway Patrol seized 24 pounds of methamphetamine. This year, through late July, troopers have grabbed 303 pounds. More. 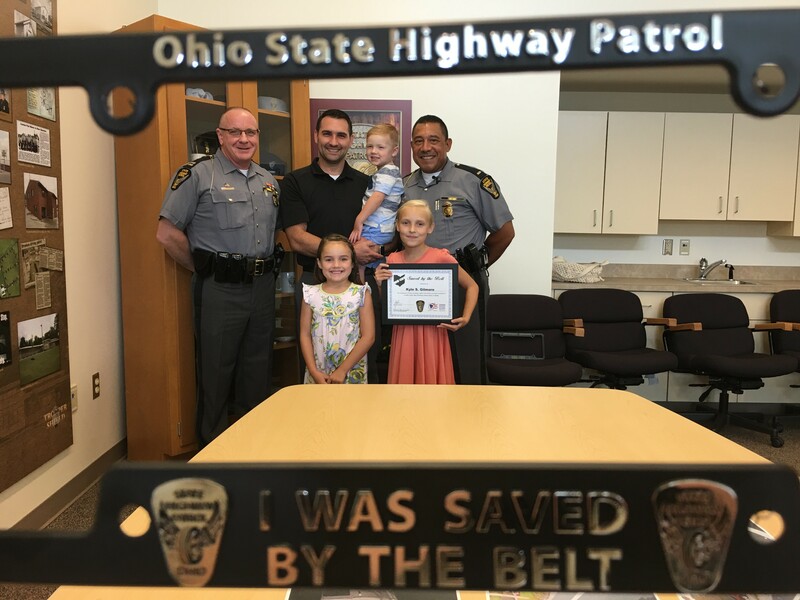 Ohio State Highway Patrol recognized Kristie Hayhurst on Thursday with the "Saved by the Belt” award. More. As Ohio's kids head back to school, it's important to look at how they get there. For many students, their day starts and ends by riding on a school bus. More. 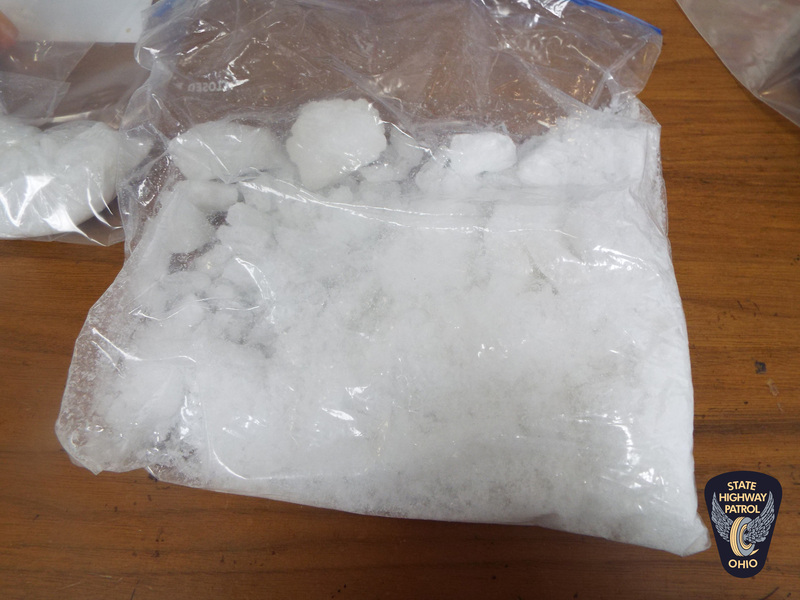 Methamphetamine seizures in the Buckeye State are on pace to quadruple in 2018 following a record year in 2017, Ohio Highway Patrol data indicates. More. On July 27, troopers stopped a 2018 Chevy Malibu with Ohio registration for a following too close violation on the Ohio Turnpike in Erie County. During the stop, a bag containing 123 Oxycodone pills worth $4,018 was seized from the female passenger. The driver, Brian E. Cooper, 35, and passenger, Courtney E. Slanker, 23, both from Akron, were charged with possession and trafficking in a schedule II drug, both third-degree felonies. Both were incarcerated in the Erie County Jail. In an effort to reduce drug sales, gun crimes, and traffic pursuits in the City of Dayton, officers utilize the Ohio State Highway Patrol aircraft to track vehicles who fail to comply with traffic stops. More. On July 17, troopers stopped a 2002 Chevrolet Venture with Ohio registration for a left-of-center violation on Chestnut Street in the city of Painesville in Lake County. Upon approach of the vehicle, troopers observed drug paraphernalia in plain view. A probable cause search of the suspect revealed a bag of methamphetamine in his pocket, and two bags containing 161 grams of methamphetamine in the vehicle worth $12,877. The driver, Rickey Lee Moody, 38, of Creston, OH, was charged with trafficking and possession of a schedule II controlled substance, both first-degree felonies; possession of drug paraphernalia, a fourth-degree misdemeanor; and possession of marijuana and drug paraphernalia, both minor misdemeanors. On July 16, troopers stopped a 2013 Honda Accord with Ohio registration for a driving under suspension violation on State Route 4 in Hamilton County. During interaction with the occupants, troopers detected an odor of marijuana coming from the vehicle. 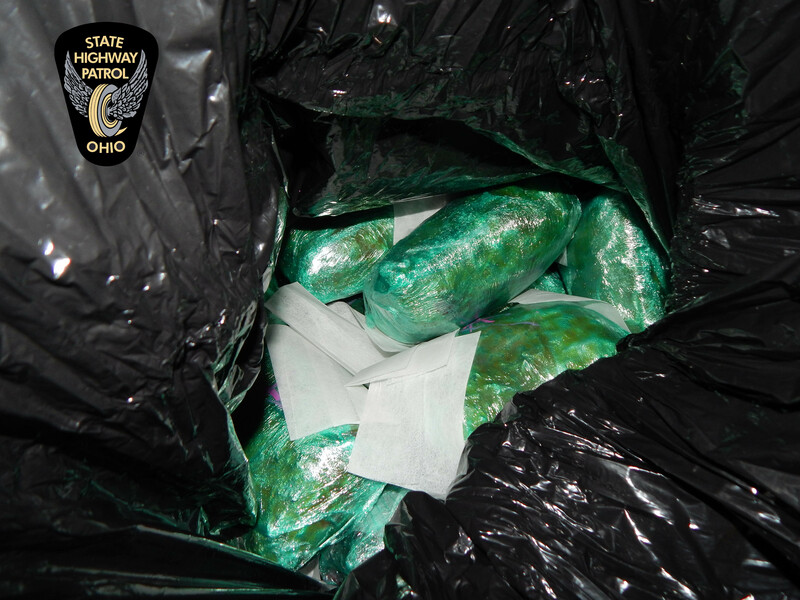 During a pat-down for weapons, troopers found 1 pound of heroin on a passenger. A probable cause search of the vehicle recovered additional heroin. The contraband has a street value of $85,050. The driver, Donald Toran, 39, and passengers, Justin Toran, 38, and De&apos;ondrea Chambers, 33, all from Cincinnati, were charged with possession and trafficking in heroin, both first-degree felonies. The individuals were incarcerated in the Hamilton County Jail. Troopers from the Ohio Highway Patrol drove their cruisers right up to the back door of Butler Elementary on Wednesday to a mock active shooter scenario, guns drawn as a masked shooter on the roof fired down on them. More. Drivers are often urged by law enforcement to buckle up and wear their seat belts while on the road and, on Monday, the Ohio State Highway Patrol provided an example of how this practice can save lives. More. Troopers stopped a rented 2017 Hyundai Sonata with New Jersey registration for a following too close violation on the Ohio Turnpike in Summit County. Criminal indicators were observed and a Patrol drug-sniffing canine alerted to the vehicle. A probable cause search revealed a digital scale and 176 Oxycodone pills worth $5,750. The driver, Devin D. Wesley, 23, of Westland, Mich., and passenger, Darius D. Bell Jr., 23, of Detroit, Mich., were incarcerated in the Summit County Jail. The men were charged with possession and trafficking in a schedule II controlled substance, both second-degree felonies. On July 16, troopers stopped a 2001 Toyota Highlander with New Mexico registration for a speed violation on Interstate 70. While interacting with the driver, troopers detected an odor of marijuana coming from the vehicle. A probable cause searched revealed 3 pounds of psilocybin mushrooms, 144 doses of LSD, 450 doses of nitrous oxide, an ounce of cocaine and 70 grams of marijuana valued at approximately $40,000. The driver, Patrick Miller, 30, of Albuquerque, was incarcerated in the Tri-County Jail and charged with possession of drugs, a first-degree felony. If convicted, he could face up to 10 years in prison and up to a $20,000 fine. The first indictment in what federal prosecutors called a southwest Ohio-based, Mexican cartel-linked methamphetamine trafficking ring stemmed from a June 2017 Ohio State Highway Patrol traffic stop on Interstate 70 in Preble County. More. Three South Americans traveling to the World Flying Disc Federation World Championships in Warren County covered the final miles to get there in Ohio Highway Patrol cruisers. More. On July 10, troopers stopped a 2009 Toyota Avalon with New Jersey registration for a following too close violation on the Ohio Turnpike in Wood County. During interaction with the driver, troopers detected an odor of raw marijuana coming from the vehicle. A probable cause search revealed several laundry bags containing 40 pounds of marijuana worth $93,400 in the vehicle&apos;s trunk. The driver, Nadav Dagan, 58, of Metuchen, N.J., was charged with possession and trafficking in marijuana, both third-degree felonies. Dagan was incarcerated in the Wood County Jail. A major methamphetamine and opioid distribution conspiracy has been uncovered, and seven defendants will be prosecuted, according to local, state and federal investigators. More. 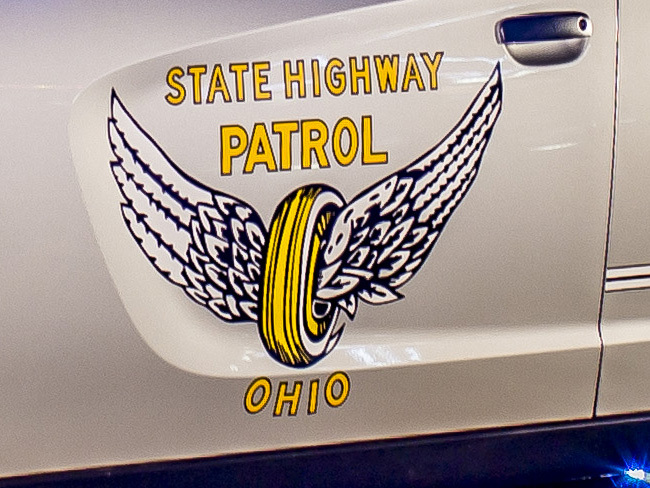 The Ohio State Highway Patrol is reporting eight people lost their lives in four traffic crashes during the July Fourth reporting period, which began Tuesday, July 3 and ended Wednesday, July 4. More. The Ohio Highway Patrol has announced it is partnering with the Great Lakes Initiative to address unsafe driving around commercial vehicles. More. Twenty-five people were indicted in federal court for their roles in a conspiracy to traffic drugs in Elyria and the surrounding area, including fentanyl, carfentanil, heroin, cocaine, crack cocaine and fentanyl analogues pressed to look like pills of Percocet. More. 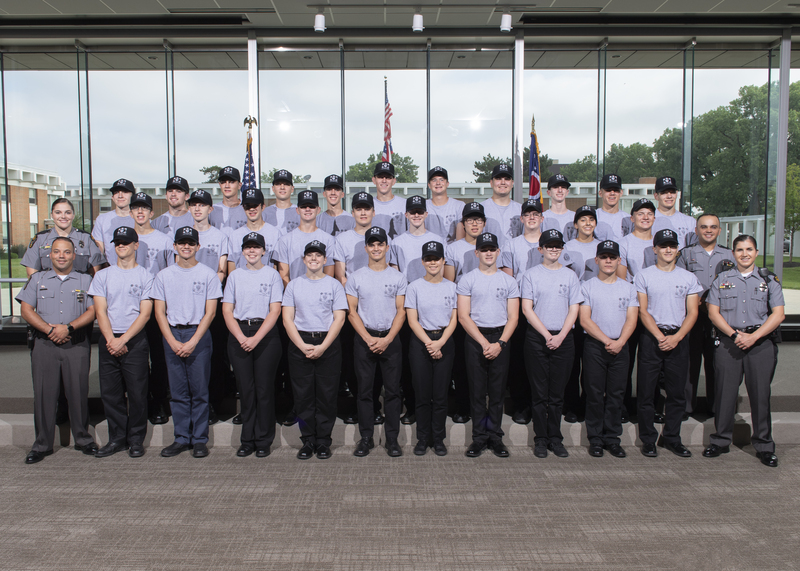 This week, a select group of students with an interest in law enforcement took part in Junior Cadet week at the Ohio State Highway Patrol&apos;s Training Academy. 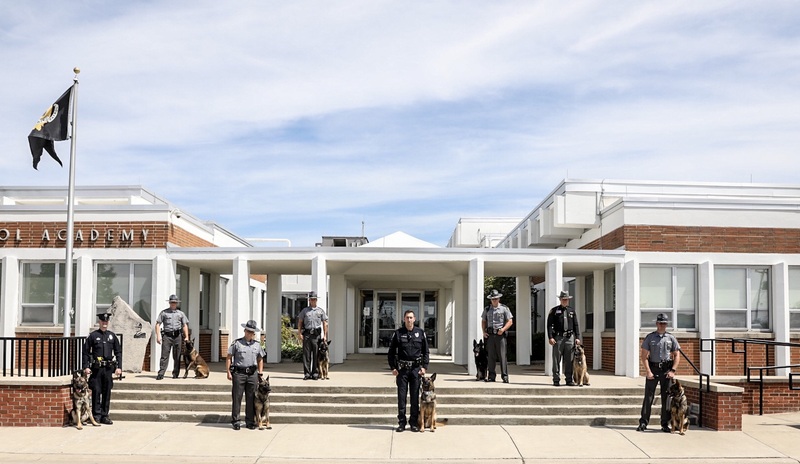 They experienced aspects of the same training that Patrol cadets go through to become troopers, including physical training, canine and criminal patrol operations, and crash investigation. Today, the Patrol would like to congratulate them on their graduation from the program. Today is the kick-off of the 23 annual American Red Cross Battle of the Badges Blood Drive. Law enforcement, firefighters and other first responders are often aware of the need for blood when responding to emergencies. In the spirit of saving lives, we have joined forces to give blood and to encourage the public to join us in a friendly competition to see which group can recruit the most donations — law enforcement or firefighters. 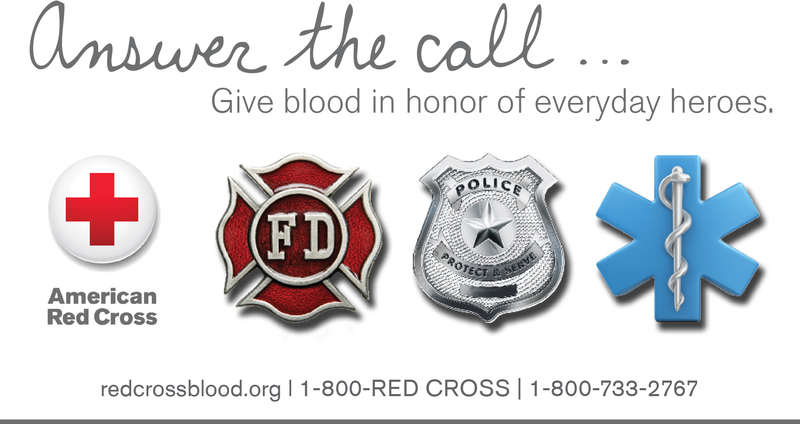 Go to any Red Cross blood drive in Central Ohio between Thursday, June 28 and Tuesday, July 31 to give blood and vote for either firefighters or police officers. In the end, the patients who receive the blood are the real winners. 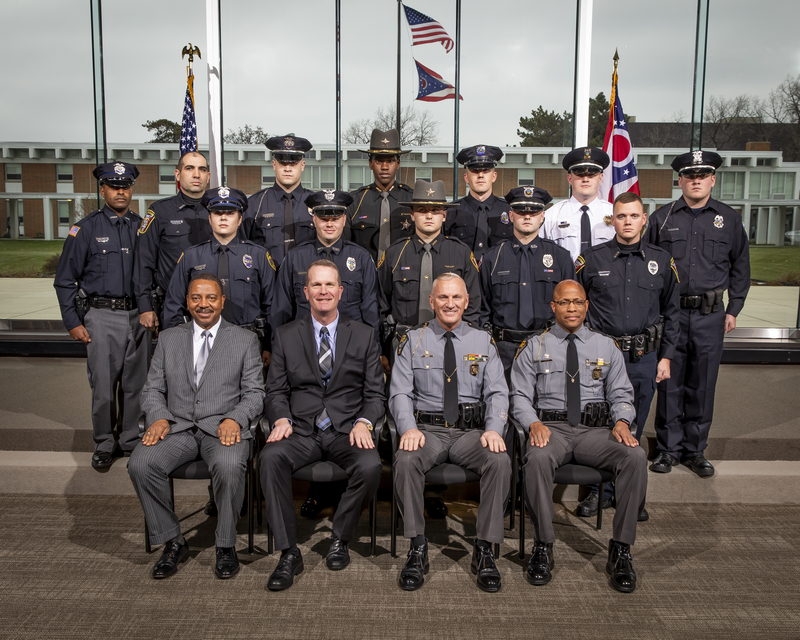 Please join us in congratulating the newly promoted members of the Ohio State Highway Patrol. Front row (L-R): Staff Lieutenant Matthew J. Hamilton, Lieutenant Martina J. Jackson, Staff Lieutenant Darren K. Thomas, Staff Lieutenant David R. Brown and Staff Lieutenant Nakia J. Hendrix. Back row (L-R): Lieutenant Robert A. Curry, Sergeant Brad M. Evans, Sergeant Benjamin C. Dennison, Sergeant Jeffrey A. Kaess, Sergeant Kaitlin D. Fuller and Lieutenant Ronald E. Anderson. 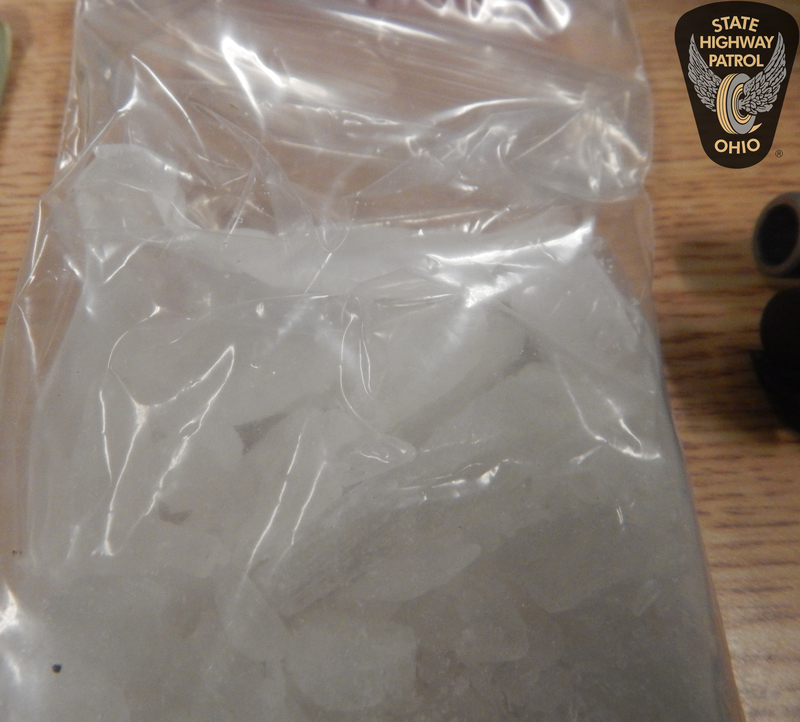 10 indicted on methamphetamine charges following "Operation Crystal Clear"
On June 13, troopers stopped a rented 2018 Toyota sedan with Pennsylvania registration for a speed violation on U.S. 6 in Sandusky County. During interaction with the occupants, troopers detected an odor of marijuana coming from the vehicle. A probable cause search revealed 3 pounds of marijuana in vacuum sealed bags in the trunk and a hi-point 9 mm loaded gun. The contraband has an approximate street value of $7,000. The driver, Darius R. Badley, 21, of Euclid, and passengers, David J. Bynum, 26, of Tacoma, Wash., and Marcus E. White, 29, of Lacey, Wash., were charged with possession and trafficking in marijuana, both third degree felonies. White was also charged with weapons under disability, a third-degree felony. The individuals were in incarcerated in the Sandusky County Jail. 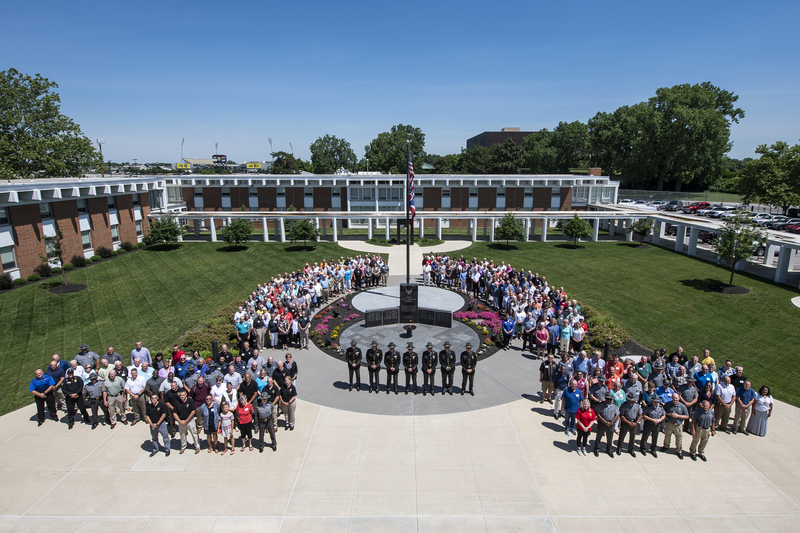 The Ohio State Highway Patrol is proud to honor our retirees for their dedication during and after their Patrol service. Today, our retirees were recognized as they gathered at the Academy for the annual retiree cookout. Thank you to our sponsors the Ohio State Highway Patrol Federal Credit Union, the Ohio State Highway Patrol Retirees Association, the Ohio State Troopers Retirees Association and the Ohio State Highway Patrol Auxiliary for providing a great event. Congratulations to the 2018 Buckeye Girls State Troopers! 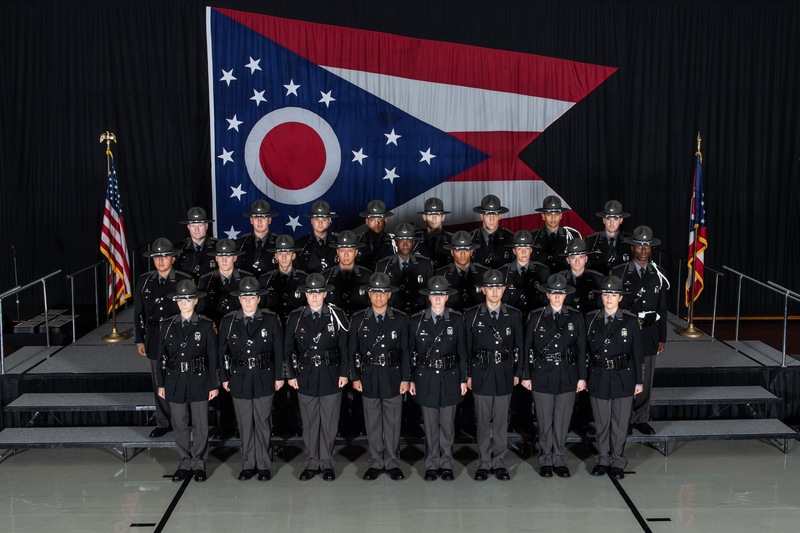 The Ohio State Highway Patrol is proud to support the American Legion Auxiliary, Buckeye Girls State. 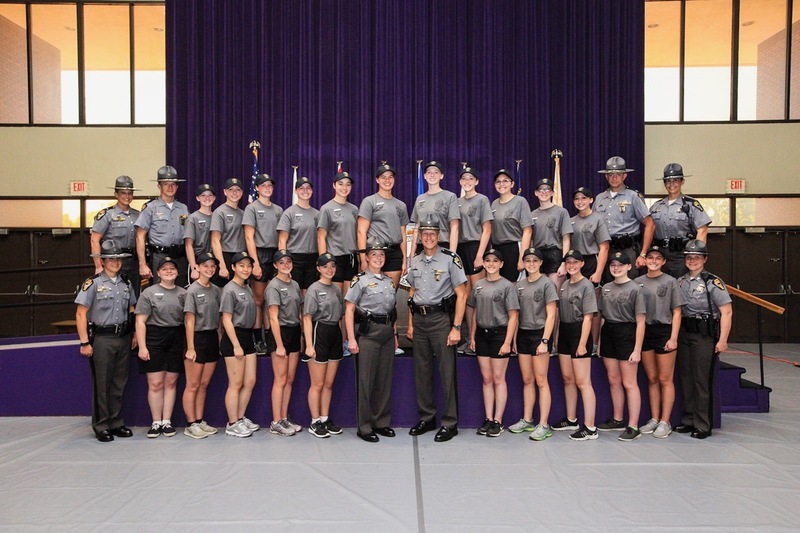 A select group of high school students got the unique experience of learning what it's like to be a trooper under the direction of active personnel. From the Ohio Attorney General–Ohio Attorney General Mike DeWine, Montgomery County Sheriff Phil Plummer, and U.S. Department of Homeland Security Investigations Special Agent in Charge Steve Francis today announced the seizure of approximately 20 pounds of fentanyl with the capability of killing more than four million people. More. On June 7, troopers stopped a 2003 Chevrolet Blazer with Ohio registration for a speed violation on Interstate 71 in Warren County. During interaction with the driver, troopers detected an odor of marijuana coming from the vehicle. A probable cause search revealed 20 alprazolam pills, more than 1 pound of marijuana, two pipes and a loaded 9 mm handgun. The contraband has an approximate street value of $6,800. The driver, Jason M. Ryan, 43, of Oregonia, was charged with improper handling of a firearm, a fourth-degree felony; possession of marijuana and controlled substance, both fifth-degree felonies; and possession of drug paraphernalia, a minor misdemeanor. On June 5, troopers stopped a 2004 Dodge Ram pick-up truck with West Virginia registration for an improper lane change violation on Interstate 70 in Preble County. During interaction with the occupants, troopers detected an odor of burnt marijuana coming from the vehicle. A probable cause search revealed a plastic bag of marijuana roaches, two evape pens with THC oil, more than than 1 pound of marijuana, 2 ounces of THC edibles and a half pound of solid hashish in jars. The contraband has an approximate street value of $12,637. The driver, Devon Young, 20, from Fairmont, W.Va., and passengers, Zeb Young, 23, and Nathaniel Ware, 24, both from Elkins, W.Va., were charged with possession of hashish, a third-degree felony; possession of marijuana and criminal tools, both fifth-degree felonies; and possession of drug paraphernalia, a minor misdemeanor. The individuals were incarcerated in the Preble County Jail. 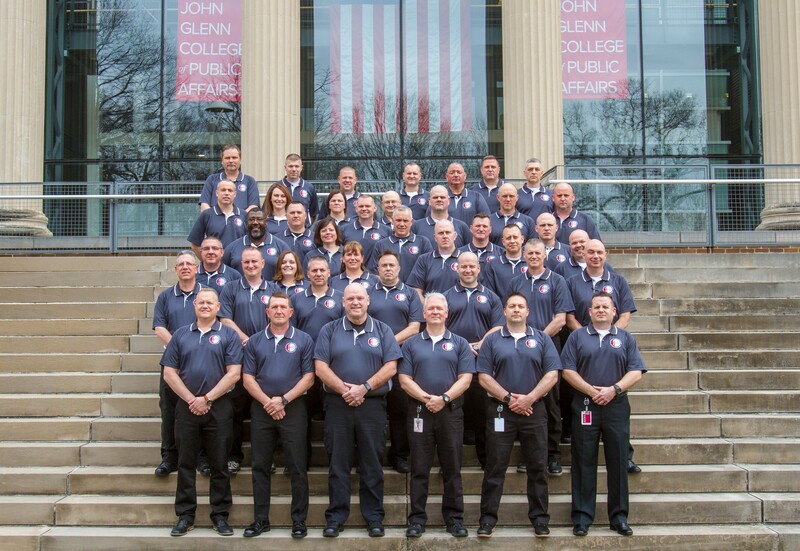 The sixth Public Safety Leadership Academy class graduated 40 law enforcement leaders on June 8 after 11 weeks of accredited, college-level training through a partnership with The Ohio State University – John Glenn College of Public Affairs. Read More. 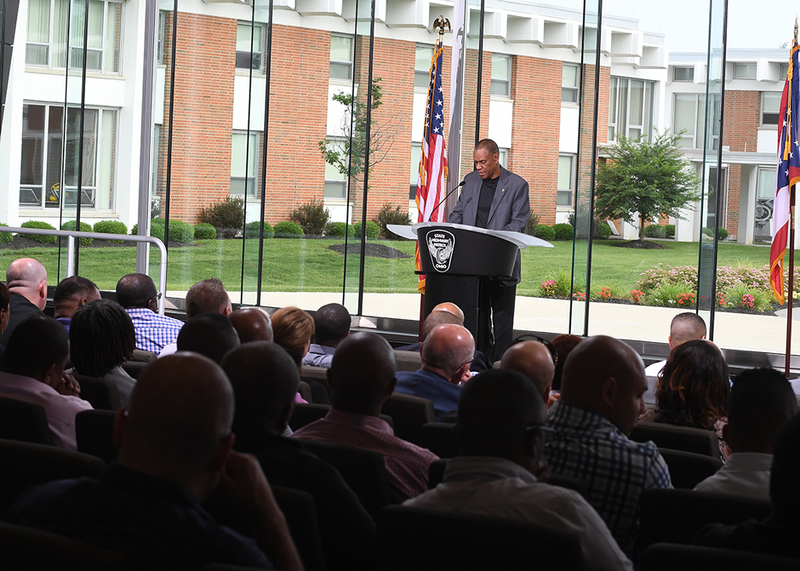 The Ohio State Highway Patrol hosted the 2018 African American Leadership Conference which provided employees with the opportunity to network, foster teamwork and participate in conversation. The Patrol is committed to the leadership development of its employees. This event was a great success thanks to the speakers, planning committee and all who attended. Lieutenant Colonel Kevin Teaford and District 6 Chaplain Jerome Taylor opened the conference. Engaging presentations followed with speakers including retired Lieutenant Colonel Gil Jones, Columbus Urban League President and CEO Stephanie Hightower, The Ohio State University Athletic Director Gene Smith, Ohio State football player Jordan Fuller, Cleveland State University Police Chief Gary Lewis, and closing remarks by Lieutenant Colonel Richard Fambro and Chaplain Taylor. On May 26, troopers stopped a 2013 Chevrolet Impala with Ohio registration for a left-of-center violation on Munn Road in Newbury Township in Geauga County. During interaction with the driver, troopers detected an odor of marijuana coming from the vehicle. A probable cause search revealed 67 morphine pills, 1,300 grams of various marijuana edibles and raw marijuana worth $8,510. The driver, Jaren Bouyer, 34, of Twinsburg, was charged with possession of schedule II substance, a third-degree felony, possession and trafficking in drugs, both fourth-degree felonies. Bouyer was incarcerated in the Geauga County Jail. The investigation of a shooting early Thursday evening unfolded quickly across several Akron neighborhoods before ending in an arrest. More. On May 25, troopers stopped a 2016 Honda Civic with Ohio registration for a speed violation on state Route 129 in Butler County. During interaction with the driver, troopers detected an odor of marijuana coming from the vehicle. A probable cause search revealed more than 3 pounds of marijuana and more than 27 grams of hash in the vehicle. The contraband has an approximate street value of $14,550. The driver, John Troxell, 22, of Hamilton, was charged with possession and trafficking in marijuana, both third-degree felonies, and possession of hash, a fifth-degree felony. Troxell was incarcerated in the Butler County Jail. Ohio State Highway Patrol troopers filed felony drug charges against an Ohio man after a traffic stop in Miami County. During the traffic stop, troopers seized 74 grams of crystal methamphetamine valued at approximately $3,945. On May 18, troopers stopped a 2009 Dodge Challenger with Georgia registration for a speed violation on Interstate 71 in Cuyahoga County. During interaction with the driver, troopers detected an odor of raw marijuana coming from the vehicle. 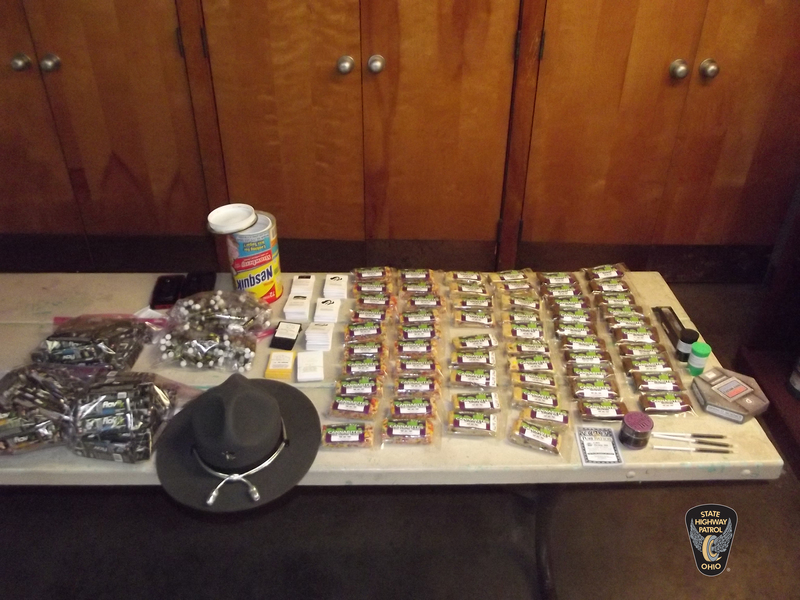 A probable cause search revealed 839 grams of marijuana edibles worth $4,195. Troopers also located a loaded .22 caliber handgun. The driver, Cashmere Coleman, 38, from Atlanta, was charged with possession and trafficking in marijuana, a fourth-degree felony and weapons under disability, a third-degree felony. Ohio State Highway Patrol troopers filed felony drug charges against a Michigan man and woman after a traffic stop in Warren County. 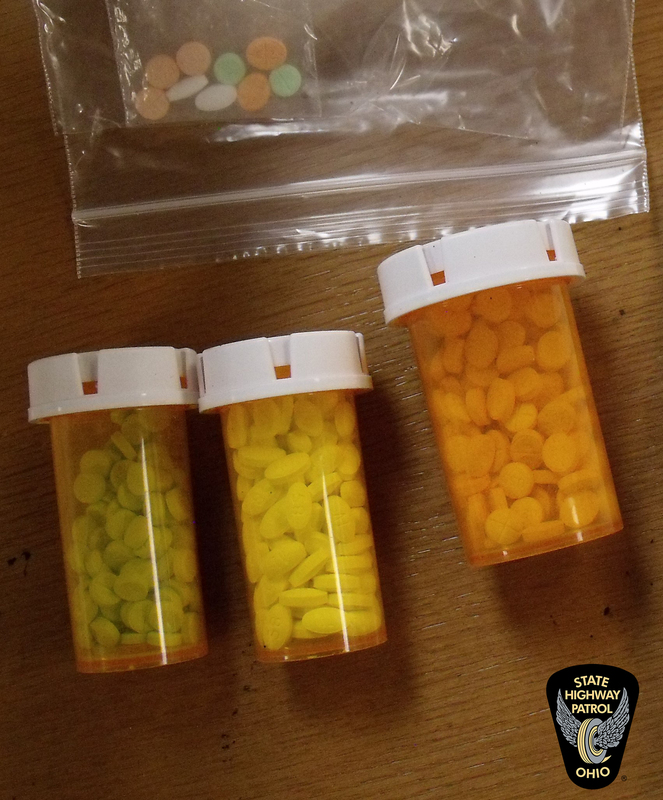 During the traffic stop, troopers seized 950 ecstasy pills and 290 hydrocodone pills valued at approximately $17,890. On May 8, 2018, troopers stopped a 2001 Chevrolet Impala with West Virginia registration for a speed violation on the Ohio Turnpike in Summit County. Criminal indicators were observed and the driver admitted to having marijuana inside the vehicle. A probable cause search revealed approximately 10 pounds of marijuana worth $23,350 in the vehicle's trunk. The driver, Troy G. Brown, 46, of Howell, Mich., was charged with possession and trafficking in marijuana, both third-degree felonies. 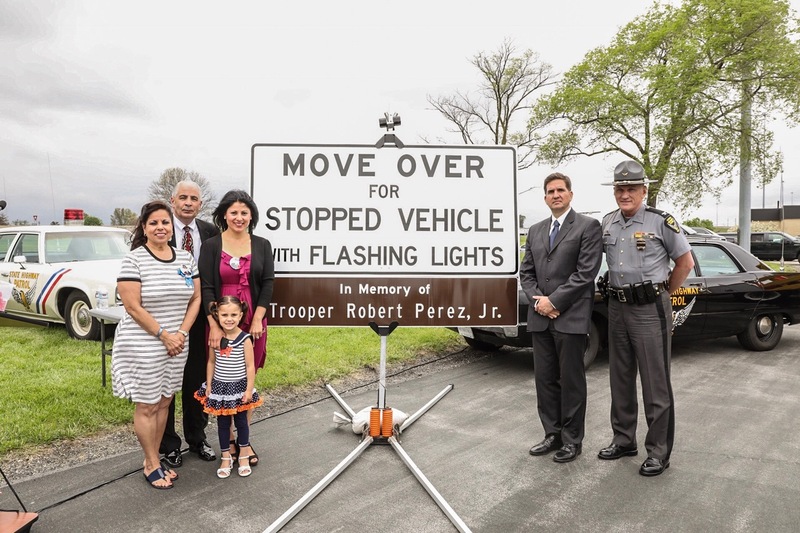 Members of the Ohio State Highway Patrol, the Ohio Turnpike and Infrastructure Commission, and the Perez family gathered on May 15 to dedicate an Ohio Turnpike Memorial Sign in memory of Trooper Robert Perez, Jr.
On National Peace Officers Memorial Day we honor the men and women who made the ultimate sacrifice in the line of duty and pay tribute to the survivors who have been left behind. Ohio State Highway Patrol troopers filed felony drug charges against a North Carolina woman after a traffic stop in Guernsey County. During the traffic stop, troopers seized 110 pounds of heroin and methamphetamine valued at approximately $3,700,000. Read More. On May 4, 2018, troopers stopped a 2006 Honda Civic with Ohio registration for a marked lanes and license plate violation on U.S. 35 in Gallia County. Criminal indicators were observed and a Rio Grande Police Department drug-sniffing canine alerted to the vehicle. 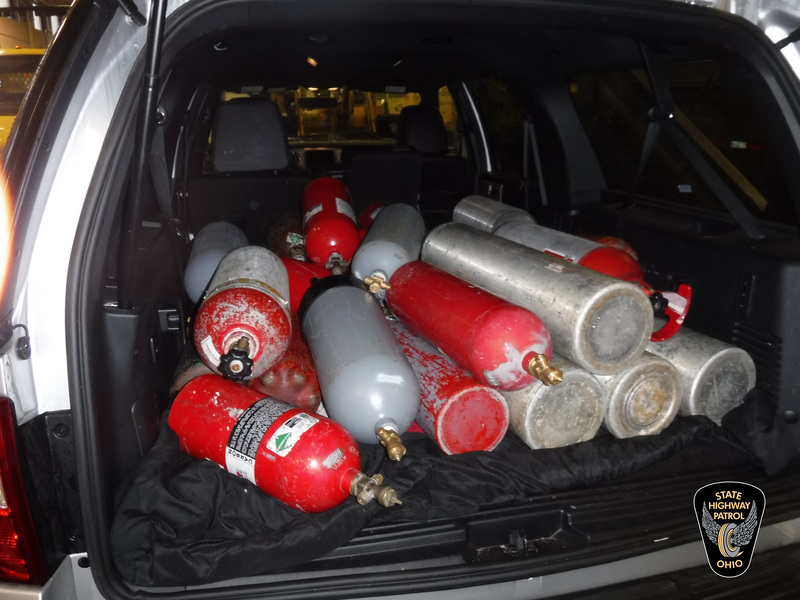 A probable cause search revealed 453 grams of methamphetamine in the vehicle worth $43,000. The driver, Erica Mix, 27, and passenger, Michelle Mix, 49, both from Columbus, were charged with possession of methamphetamine, a first-degree felony. Both were incarcerated in the Gallia County Jail. 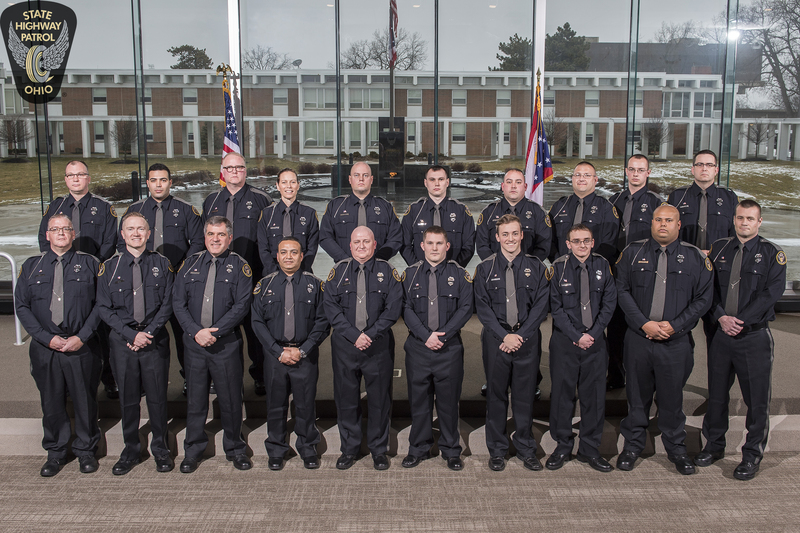 Please join us in congratulating the newly promoted members of the Ohio State Highway Patrol. Front: Lieutenant Colonel Richard S. Fambro. Middle row (L-R): Captain Ronald E. Raines and Major David A. Church. Back row (L-R): Sergeant Ryan R. Stanley, Sergeant John R. Nemastil and Sergeant Nicholas R. Boes. 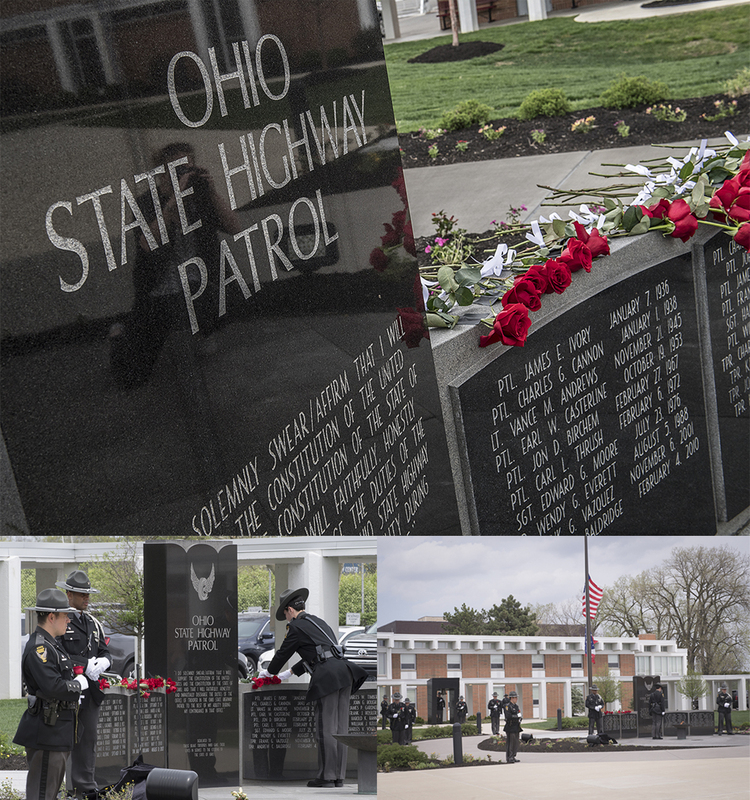 Today, we honored the fallen members of the Ohio State Highway Patrol at our annual Memorial Ceremony. 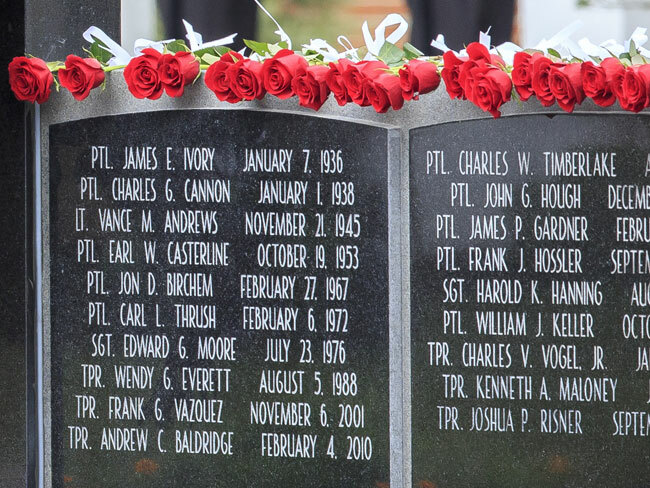 In the Patrol's 85 years of service to Ohio, 46 individuals have made the ultimate sacrifice in the line of duty. This includes sworn personnel - troopers, sergeants, lieutenants and the now-retired ranks of patrolman and corporal - as well as radio operators, auxiliary officers, an investigative agent and load limit inspectors. 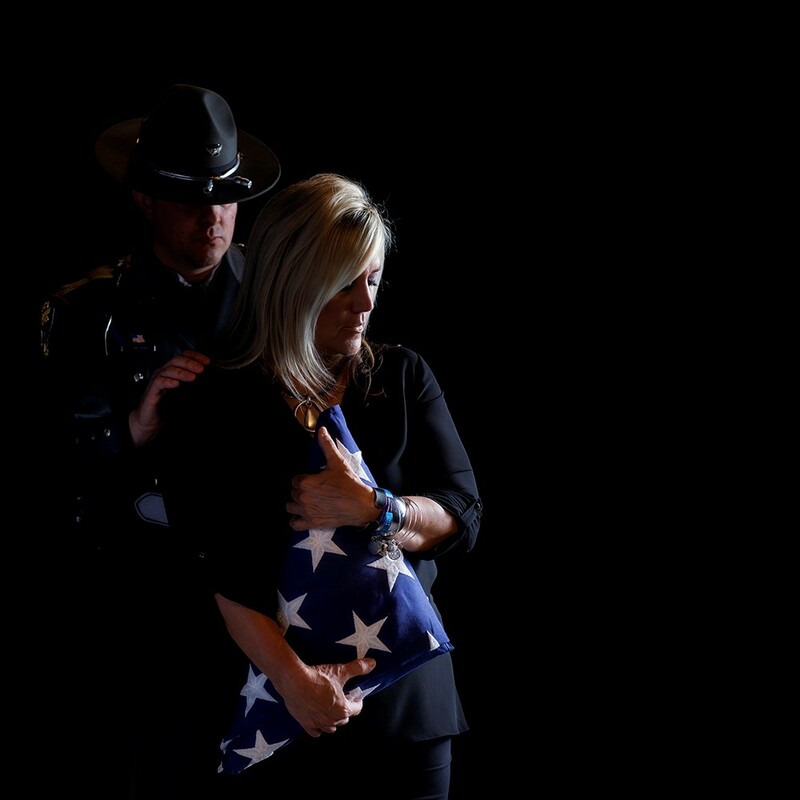 The name of each fallen member is engraved on the black granite walls of our Memorial and illuminated by the eternal flame. From the Washington County Sheriff”s Office – An investigation by Agents of the Ohio Organized Crimes Investigations Commission, Washington Morgan Noble Major Crimes Task Force resulted in the arrests of Felicia Jean Goff and Robert Otis Powers.More. Troopers of the Ohio State Highway Patrol Van Wert Post stopped an alleged kidnapper traveling into Ohio from Virginia. More. On April 24, 2018, troopers stopped a rented 2017 Hyundai Sonata with Texas registration for speed and following too close violations on Interstate 75 in Miami County. Upon interaction with the driver, Joshua Holloway, 28, of Detroit, he admitted to having prescription pills in the vehicle. A probable cause search of the vehicle revealed 54 Oxycodone pills, 85 Xanax pills, and 367 Hydrocodone pills. The contraband has a street value of $2,800. Holloway was charged with possession of Hydrocodone pills, a second-degree felony, possession of Hydrocodone and Oxycodone pills, both third-degree felonies and possession of Xanax pills and criminal tools, both fifth-degree felonies. He was incarcerated in the Miami County Jail. On April 18, 2018, troopers stopped a 2016 Dodge Charger with Alabama registration for a turn signal violation on the Ohio Turnpike in Sandusky County. Criminal indicators were observed and a Patrol drug-sniffing canine alerted to the vehicle. A probable cause search revealed 110 grams of fentanyl in the vehicle. The contraband has a street value of $64,807. The suspects, Pinchello Bell, 36, of Park Forest, Ill, Deon Thompson, 53, and Leroy Buttrom, 39, both from Detroit, Mich., were charged with possession and trafficking, both first-degree felonies. The individuals were incarcerated in the Sandusky County Jail. On April 18, 2018, troopers stopped a 2010 Ford Fusion with Pennsylvania registration for a lane violation on Interstate 80 in Wood County. Criminal indicators were observed and a Patrol drug-sniffing canine alerted to the vehicle. A probable cause search revealed a duffle bag containing 14 pounds of marijuana worth $65,000. The driver, Rolando G. Redway, 42, of Upper Darby, Pa., was charged with possession and trafficking in marijuana, both third-degree felonies. Redway was incarcerated in the Wood County Jail. On April 18, 2018, troopers stopped a 2006 Nissan pick-up truck with Tennessee registration for improper lane change violations on Interstate 75 in Miami County. During interaction with the driver, troopers detected an odor of marijuana coming from inside the vehicle. A probable cause search revealed numerous zip-lock bags of hydroponic marijuana, weighing a total of 6 pounds and worth $17,094. The driver, Carnie J. Colliver, 20, of Mount Juliet, Tenn., was charged with possession of marijuana, a third-degree felony and possession of criminal tools, a fifth-degree felony. From The Times Leader – Ohio State Highway Patrol troopers know the dangers of distracted driving, and they are observing National Distracted Driving Awareness Month as an occasion to remind motorists to keep their eyes on the road. More. On April 17, 2018, troopers stopped a rented 2016 Chevrolet Cruze with Texas registration for a turn signal violation on the Ohio Turnpike in Ottawa County. Criminal indicators were observed and a Patrol drug-sniffing canine alerted to the vehicle. A probable cause search revealed 142 grams of heroin in a vacuum-sealed package. The contraband has a street value of $25,276. The suspect, Demarco M. Johnson, 27, of Westfield, Mich., and Demetrius Cassity, 23, of Detroit, Mich., were charged with possession and trafficking in heroin, both first-degree felonies. Both men were incarcerated in the Ottawa County Jail. From WHIO – The Ohio State Highway Patrol is working with five other states to crack down on distracted driving. More. 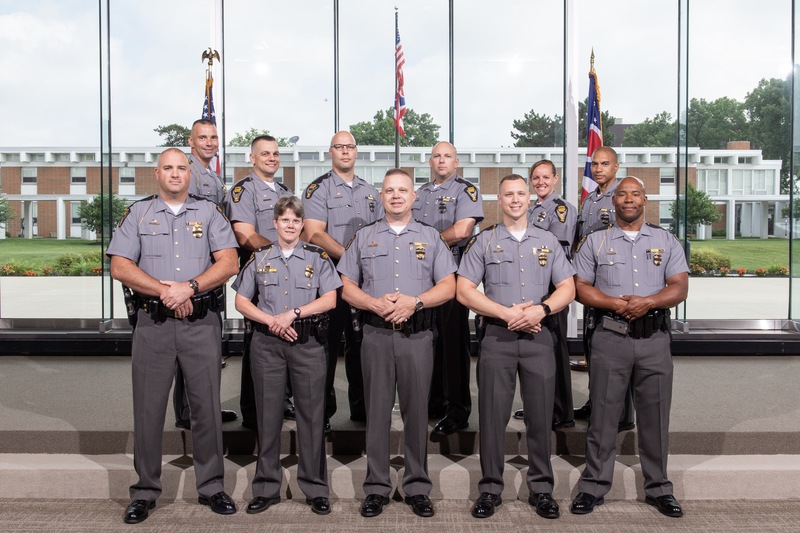 Please join us in congratulating the newly promoted members of the Ohio State Highway Patrol. Front row (L-R): Lieutenant Lawrence Roberts, Captain Charles A. Jones and Staff Lieutenant Douglas A. Hamman. Back row (L-R): Sergeant Samuel C. Criswell and Sergeant Jerrold T. March. Congratulations to our troopers who were recognized today for leading the state in removing impaired drivers from our roads. In 2017, troopers arrested 27,340 drivers under the influence of drugs or alcohol which led to a reduction in impaired driving fatal crashes. Congratulations to our troopers who were recognized today for their seat belt enforcement efforts last year. In total, troopers cited 136,400 for not wearing safety belts. Troopers ask that you wear your safety belt every time and insist that those who travel with you buckle up as well. On April 2, 2018, troopers stopped a 2003 Honda Accord with Ohio registration for a speed violation on Interstate 275 in Hamilton County. During interaction with the occupants, troopers detected an odor of raw marijuana coming from the vehicle. A probable cause search of the vehicle revealed a loaded handgun under the driver's seat, 20 grams of marijuana on the driver's person and 60 grams of heroin on the passenger's person. The contraband has an approximate street value of $9,000. The driver, Davontay Wynn, 21, of Cincinnati, was charge with weapons under disability, a third-degree felony, improper handling, a fourth-degree felony and possession of marijuana, a minor misdemeanor. The passenger, Montiar Bell, 27, of Cincinnati, was charged with possession of heroin, a first-degree felony. Both were incarcerated in the Hamilton County Justice Center. On March 31, 2018, troopers stopped a 2006 Dodge Caravan with Michigan registration for a speed violation on Interstate 80 in Trumbull County. During interaction with the driver, troopers detected an odor of burnt and raw marijuana coming from the vehicle. A probable cause search revealed approximately 15 marijuana plants and loose marijuana totaling 20 pounds. The contraband has an approximate street value of $50,000. The driver, Robert Larch, 19, of Ecorse, Mich., was charged with trafficking, a fourth-degree felony and possession of marijuana, a fifth-degree felony. Larch was incarcerated in the Trumbull County Jail. On March 26, 2018, troopers stopped a 2003 Buick with Ohio registration for a speed violation on State Route 4 in Erie County. Criminal indicators were observed and an Erie County Sheriff's Office drug-sniffing canine alerted to the vehicle. A probable cause search revealed 63 grams of methamphetamine worth $1,912. The driver, Brandon Willard, 33, of Clyde, was charged with possession of drugs, a fifth-degree felony. Willard was incarcerated in the Erie County Jail. Tailgating, no turn signals, driving recklessly, the Ohio State Highway Patrol is cracking down on dangerous drivers. More. Congratulations to the new members of the Patrol’s “Over the Hill” club. 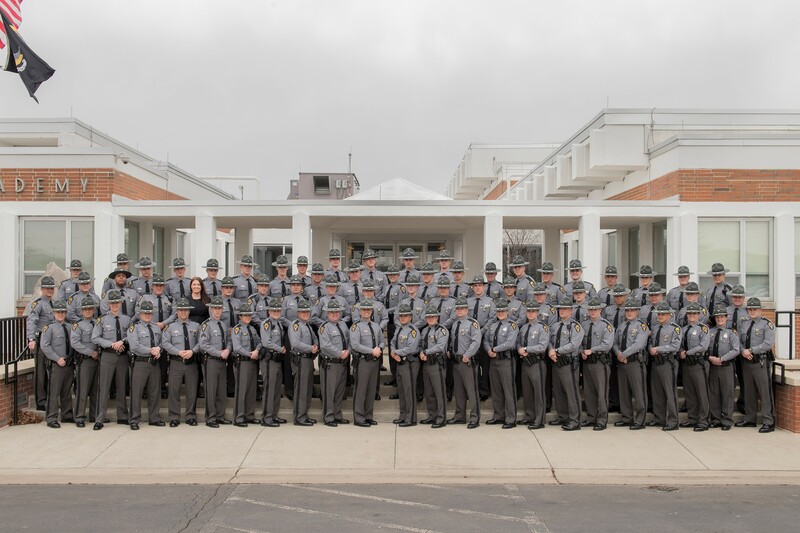 On March 23, 2018, the remaining active members of the 117th Academy Class achieved 30 years of service. Congratulations to the new members of the Patrol’s “Over the Hill” club. Back row (left to right): Sergeant Sheldon L. Robinson, Trooper David J. Schultz, Captain Patrick B. Vessels and Lieutenant Colonel Kevin D. Teaford. Front row: Sergeant Yvonne L. Thorne and Captain Chris J. Zurcher. On March 17, 2018, a 2010 Kia Forte with Ohio registration entered an OVI checkpoint in the city of Bowling Green in Wood County. During interaction with the occupants, the odor of raw marijuana was detected. A probable cause search of the vehicle revealed 37 grams of cocaine, approximately one pound of marijuana, 65 Xanax pills and a digital scale. The contraband has an approximate street value $5,984. The suspects, Kyler Famble, 19, Tyler King, 19, Kyren King, 20, Jerel Horton, 19, and George Daniel, 19, all from Cincinnati, were charged with possession and trafficking in cocaine, both first-degree felonies, trafficking in marijuana and possession and trafficking in Xanax, all fourth-degree felonies and possession of marijuana, a fifth-degree felony. The individuals were incarcerated in the Wood County Jail. On March 11, 2018, troopers stopped a rented 2012 Dodge Caravan with New York registration for a speed violation on State Route 2 in Ottawa County. Criminal indicators were observed a probable cause search of the vehicle was conducted. During the search 26 fraudulent ID cards, 36 fraudulent debit/credit cards, four new Apple iMac computers and two new iPad Pro tablets were located in the vehicle. The items have a street value of $16,000. The suspect, David Romero, 62, of Fresh Meadows, N.Y., was charged with forgery and ID theft, both fifth-degree felonies. Romero was incarcerated in the Ottawa County Jail. On March 1, 2018, troopers stopped a 2004 Chevrolet Impala with Ohio registration for a signal violation on U.S. 35 in Jackson County. During interaction with the occupants, troopers detected an odor of raw marijuana coming from the vehicle. A probable cause search revealed 19 pounds of marijuana. During a pat-down for weapons, troopers also located 154 grams of methamphetamines on a passenger. The contraband has an approximate street value of $43,900. The driver, Michael D. Odell, 21, and passengers, Joshua A. Williams, 19, and Chelsey R. Little, 19, all from Columbus, were charged with drug trafficking and possession of a controlled substance, both first-degree felonies. The individuals were incarcerated in the Jackson County Jail. From the Lima News – Ohio State Highway Patrol troopers are continuing to focus on impaired driving enforcement – and those efforts are paying off, according to area post commanders. Read More. On February 24, 2018, troopers stopped a 2013 Nissan Altima with Ohio registration for a speed violation on Interstate 475 in Lucas County. Criminal indicators were observed and a Waterville Township drug-sniffing canine alerted to the vehicle. A probable cause search revealed 10 pounds of marijuana edibles, 73 grams of hashish oil and 70 grams of solid hashish in the vehicle’s trunk. The contraband has an approximate street value of $30,350. The suspects, Amanda Meyer, 32, Stephanie Kidwell, 36, Deron Elliot, 33, and Ian Overton, 32, all from Cincinnati, were charged with possession and trafficking in marijuana, solid and liquid hashish, all third-degree felonies. The individuals were incarcerated in the Lucas County Jail. On February 22, 2018, troopers stopped a 2006 Volkswagen Jetta with Virginia registration for a marked lanes violation on the Ohio Turnpike in Summit County. Criminal indicators were observed and a Patrol drug-sniffing canine alerted to the vehicle. A probable cause search revealed 21 heat-sealed bags of high-grade marijuana weighing 25 pounds in the vehicle’s trunk. The contraband has an approximate street value of $75,000. The driver, James T. Pollard, 28, of Richmond, Va., was charged with possession and trafficking in marijuana, both third-degree felonies. Pollard was incarcerated in the Summit County Jail. On February 16, 2018, troopers stopped a 2018 Hyundai Elantra with Pennsylvania registration for a following too close violation on Interstate 77 in Guernsey County. During interaction with the occupants, troopers detected an odor of raw marijuana. A probable cause search of the vehicle revealed two baggies containing approximately 200 grams of methamphetamine worth $20,000. The driver, Jordan Lott, 27, and passenger, Ranika Babie, 27, both from Akron, were charged with possession and trafficking in methamphetamine, both first-degree felonies. Both were incarcerated in the Guernsey County Jail. 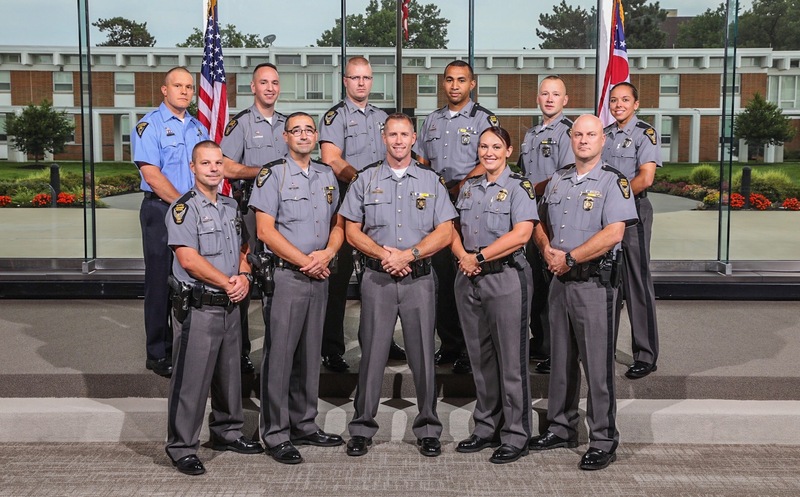 Please join us in congratulating the newly promoted members of the Ohio State Highway Patrol. Front row (left to right): Dispatch Supervisor Dawn L. Stephens and Sergeant Ivan Nunez. 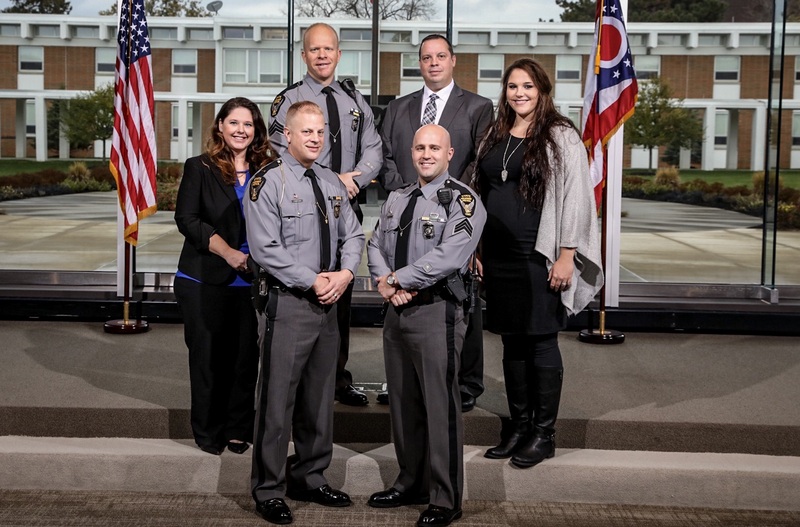 Second row (left to right): Financial Analyst Supervisor Lori L. Click, Sergeant Timothy A. Grimm, Sergeant Drew M. Hertlein and Chemical Laboratory Supervisor 2 Jacqueline C. Smith. Third row (left to right): Sergeant John Stevens, Sergeant Edward G. Franke and Sergeant Chad M. McMunn. 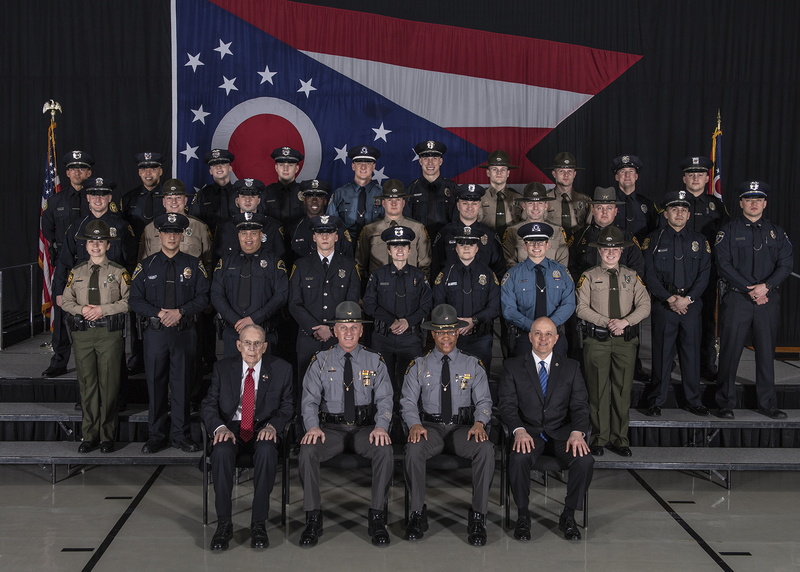 The Ohio State Highway Patrol announced the recipients of their 2017 Leadership Awards today. Read More. On February 16, 2018, troopers stopped a 2002 Volkswagen Passat with Michigan registration for a following too close violation on the Ohio Turnpike in Summit County. During interaction with the occupants, the suspects admitted to possessing 4 pounds of high grade marijuana worth $10,000. The suspects, Eric W. Versen, 28, and Jessica R. Reager, 32, both from Detroit, Mich., were charged with possession and trafficking in marijuana, both third-degree felonies. On February 14, 2018, troopers stopped a rented 2017 Toyota Camry with Indiana registration for a speed violation on U.S. 30 in Van Wert County. During interaction with the driver, troopers detected an odor of burnt and raw marijuana. A probable cause search of the vehicle revealed a small amount of marijuana on the floorboards and approximately 5 pounds of marijuana in the trunk. The contraband has an approximate street value of $12,142. The driver, D. Osha Berumen, 23, of Fort Wayne, Ind., was charged with possession and trafficking in marijuana, both third-degree felonies. Berumen was incarcerated in the Van Wert County Jail. 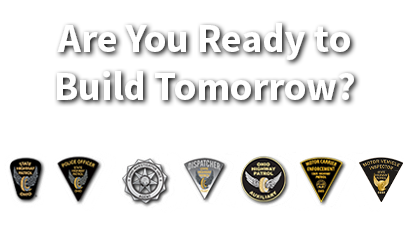 From The News-Herald – Ohio State Highway Patrol troopers through their continued efforts to look beyond the plates prevented $52,418,987 worth of drugs in 2017 from reaching Ohio communities. Read More. 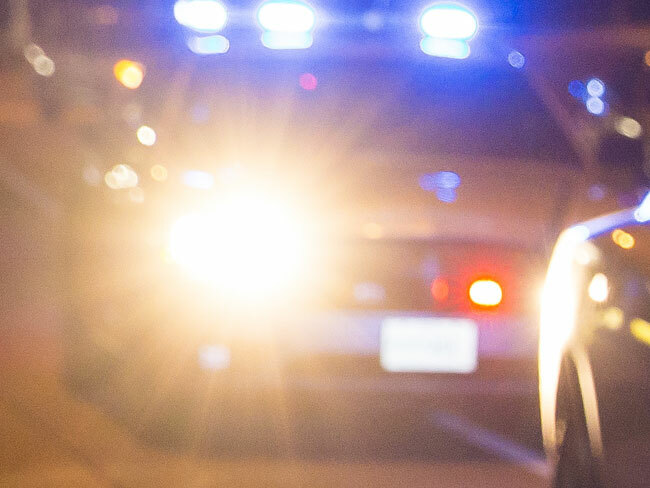 From Enquirer – Ohio, Michigan and Kentucky are working together to crack down on speeding and impaired driving on Interstate 75 this weekend, officials said. Read More. From the U.S. Attorney's Office – Four Cleveland men were named in a 25-count federal indictment that charges they conspired to distribute at least 220 pounds of marijuana and 345 pills of Oxycodone, law enforcement officials said. Read More. On February 13, 2018, troopers stopped a rented 2017 Infinity with Georgia registration for a license plate violation on the Ohio Turnpike in Summit County. During interaction with the occupants, troopers detected an odor of raw marijuana coming from the vehicle. During a pat-down, both the driver and passenger voluntarily removed plastic bags containing crack cocaine, heroin and fentanyl from their persons. The contraband has an approximate street value of $10,980. The suspects, Tyron Adams, 23, and Kamarr James, 23, both from Detroit, Mich., were charged with possession and trafficking in drugs, both first-degree felonies. Both were incarcerated in the Summit County Jail. 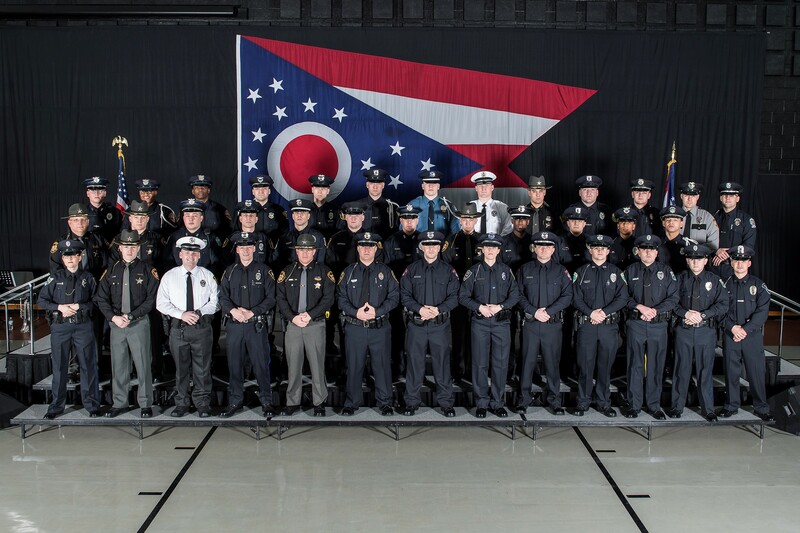 The OSHP Auxiliary is an all-volunteer force which provides assistance to troopers in the course of their duties. Among the duties of an Auxiliary officer are crash scene and traffic stop assistance, traffic control, disaster relief and special detail support. On February 7, 2018, troopers stopped a rented 2018 Chevrolet Malibu with Florida registration for a marked lanes violation on Interstate 80 in Summit County. Criminal indicators were observed and a Patrol drug-sniffing canine alerted to the vehicle. A probable cause search revealed a duffel bag containing more than 2 pounds of cocaine worth $90,000. The driver, Pedro L. Valle, 30, and passenger, Miguel A. Dejesus, 31, both of Bridgeport Conn., were charged with possession of cocaine and trafficking in cocaine, both first-degree felonies. Both were incarcerated in the Summit County Jail. On January 26, 2018, troopers stopped a 2009 Dodge Avenger with Oklahoma registration for a speed violation on Interstate 70 in Madison County. Criminal indicators were observed and the driver was removed from the vehicle. The passenger got into the driver's seat and fled until the vehicle was disabled by stop sticks. A search of the vehicle revealed 10 pounds of methamphetamine worth $100,000 and a loaded handgun. The suspects, Irene Vanderburg, 23, and Paul Lindahl, 52, both from Oklahoma City, both were charged with possession of schedule I substance, a second-degree felony, carrying concealed weapon, a fourth-degree felony and failure to comply, a third-degree felony. Both were incarcerated in the Franklin County Jail. 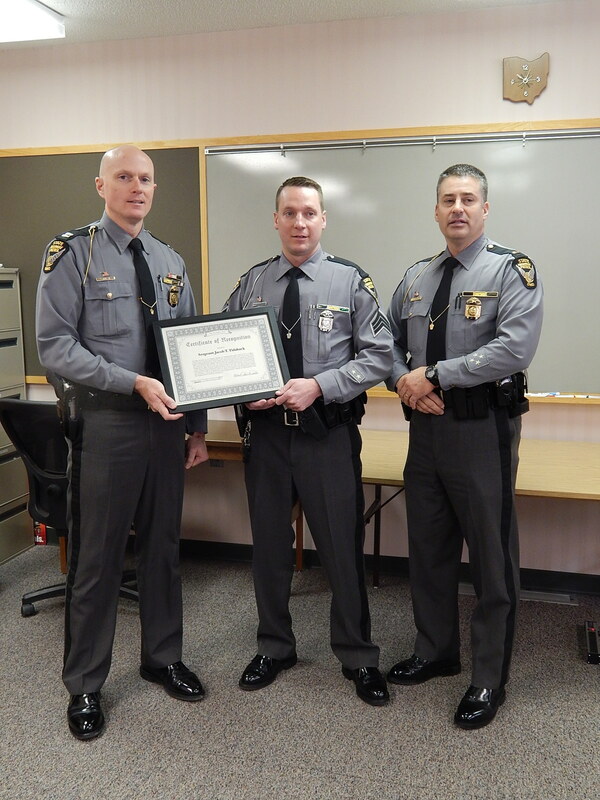 In December, Sergeant Jacob T. Tidaback witnessed a head-on crash in Huron County. He quickly approached the vehicle and observed the driver was unresponsive. A fire broke out in the engine compartment and Sgt. Tidaback removed the driver. Witnesses provided assistance to the driver as he extinguished the fire. Sgt. Tidaback provided CPR for the driver until EMS arrived. Despite his efforts, the driver later passed away. For his actions, Sgt. Tidaback was presented with a Certificate of Recognition. On January 28, 2018, troopers stopped a 2001 Buick with South Carolina registration for a marked lanes violation on U.S. 23 in Pickaway County. During interaction with the driver, signs of impairment were observed and the driver was subsequently arrested for OVI. A search incident to arrest revealed 144 Adderall pills, 146 Tramadol pills and 95 Clonazepam pills. The contraband has an approximate street value of $7,700. The driver, Jeremy D. Sims, 36, of McConnells, S.C., was charged with trafficking in drugs, a third, fourth and fifth degree felony, possession of drugs, a third-degree felony and possession of drugs, two first-degree misdemeanors. He was incarcerated in the Pickaway County Jail. Congratulations to the winners of Ace and Criminal Patrol Awards who were recognized today! 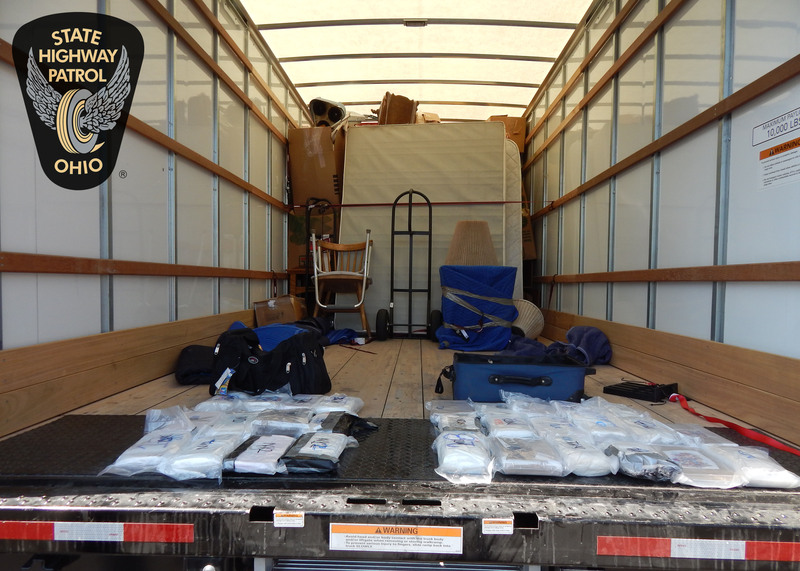 These troopers worked diligently to look "beyond the plate" in order to remove drugs from Ohio communities and return stolen vehicles to their rightful owners. On January 28, 2018, troopers stopped a 2016 Ford Explorer with Texas registration for a speed violation on the Ohio Turnpike in Portage County. During interaction with the driver, troopers detected an odor of raw marijuana coming from the vehicle. A probable cause search revealed a duffle bag containing 18 pounds of hydroponic marijuana worth $90,000. The driver, Welquis Lopez, 38, of Rockville Centre, N.Y., was incarcerated in the Portage County Jail. Lopez was charged with felony possession and trafficking in marijuana. On January 22, 2017, troopers stopped a 2015 Jeep Patriot with Georgia registration for speeding and marked lanes violations on Interstate 71 in Cuyahoga County. Criminal indicators were observed and a Patrol drug-sniffing canine alerted to the vehicle. 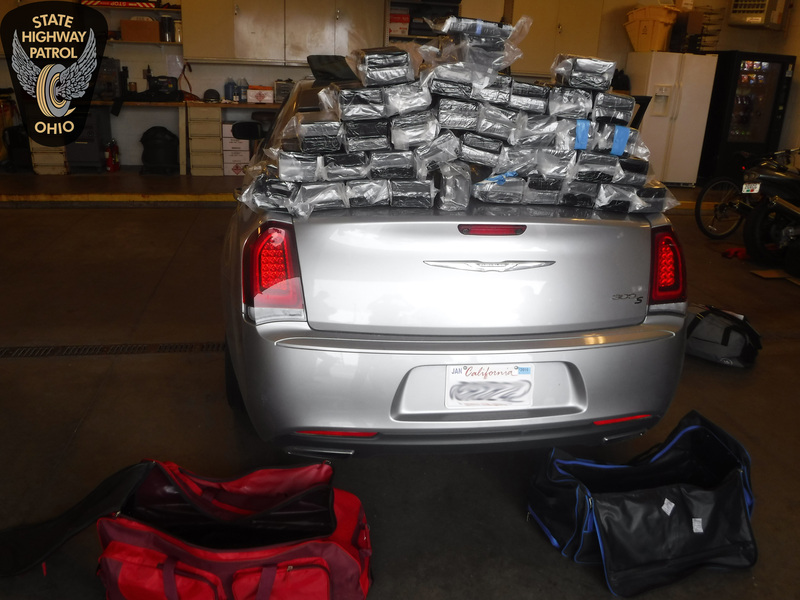 A probable cause search revealed 24 pounds of marijuana worth $96,000 in the vehicle. The driver, Jessica Strother, 28, of Cleveland, was charged with possession and trafficking in marijuana, both third-degree felonies. Strother was incarcerated in the Medina County Jail. On January 8, 2018, troopers stopped a 2012 Toyota Camry with Illinois registration for following too close and turn signal violations on Interstate 80 in Lucas County. Criminal indicators were observed and a Patrol drug-sniffing canine alerted to the vehicle. A probable cause search revealed 151 grams of heroin worth $18,132 in the vehicle's trunk. The driver, Balford Reid, 39, and passenger, Larry Neal, 46, both from Chicago, were charged with possession and trafficking in heroin, both first-degree felonies. Both suspects were incarcerated in the Lucas County Justice Center. On January 4, 2018, troopers stopped a 2006 GMC Savanna van with Indiana registration for a speed violation on Interstate 70 in Preble County. Criminal indicators were observed and a Patrol drug-sniffing canine alerted to the vehicle. A probable cause search revealed eight vacuum-sealed bundles of hydroponic marijuana weighing more than 7 pounds locked in the cargo compartment. The contraband has an approximate street value of $19,494. The driver, David A. Cole, 48, of Unionville, Ind., was charged with possession of marijuana, a third-degree felony and possession of criminal tools, a fifth-degree felony. Cole was incarcerated in the Preble County Jail. On January 5, 2018, troopers came upon a disabled 2002 Toyota with Ohio registration on Interstate 80 eastbound in Erie County. During interaction with the driver, troopers detected an odor of raw marijuana. A probable cause search of the vehicle revealed three vacuum-sealed bags of marijuana weighing more than 2 pounds worth $6,350. The driver, Tyler J. Pitts, 27, of, Parma, was charged with possession and trafficking in marijuana, both third-degree felonies. Pitts was incarcerated in the Erie County Jail. In November, Trooper Donte' M. Hanns observed a car emitting smoke that had been involved in a crash near Fremont. Nurse Ginger Havlin was on scene and rendered first aid. While they attempted to free the driver, the car caught fire. Trooper Hanns then broke the window and was able to remove the driver before the car became engulfed in flames. For their lifesaving actions, Ginger Havlin and Trooper Hanns were presented with a Certificate of Recognition. On December 31, 2017, troopers stopped a rented 2017 Ford Expedition for a speed violation on Interstate 80. Criminal Indicators were observed and a Wauseon Police Department drug-sniffing canine alerted to the vehicle. A probable cause search revealed 70 pounds of marijuana worth approximately $318,000. Read more. On December 21, 2017, troopers stopped a 2004 Jeep Cherokee with Michigan registration for speed and turn signal violations on Interstate 75 in Miami County. Criminal indicators were observed and the driver admitted to having personal use of marijuana in the vehicle. A search of the vehicle revealed more than 3 pounds of hydroponic marijuana, marijuana brownies and more than 18 grams of solid hashish in the rear cargo area. The contraband has an approximate street value of $10,215. The driver, Patrick Green, 59, of West Branch, Mich., was charged with possession of marijuana, a third-degree felony, possession of hashish and criminal tools, both fifth-degree felonies. Green was incarcerated in the Miami County Jail. On December 19, 2017, troopers stopped a 2017 Chevy Silverado pick-up truck with Ohio registration for a registration violation on Northland Boulevard in the city of Springdale in Hamilton County. A Patrol drug-sniffing canine alerted to the vehicle and a probable cause search revealed 251 grams of heroin under the driver's seat. The contraband has an approximate street value of $37,650. The driver, Hector Carillo, of Mexico, was charged with possession and trafficking in heroin, both first-degree felonies. Carillo was incarcerated in the Hamilton County Jail. 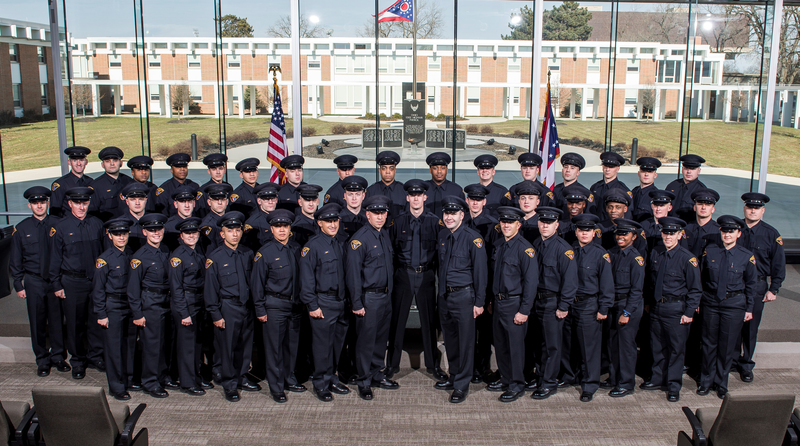 Please join us in congratulating the 138th Cleveland Basic Class on completion of their training at the Ohio State Highway Patrol Academy. 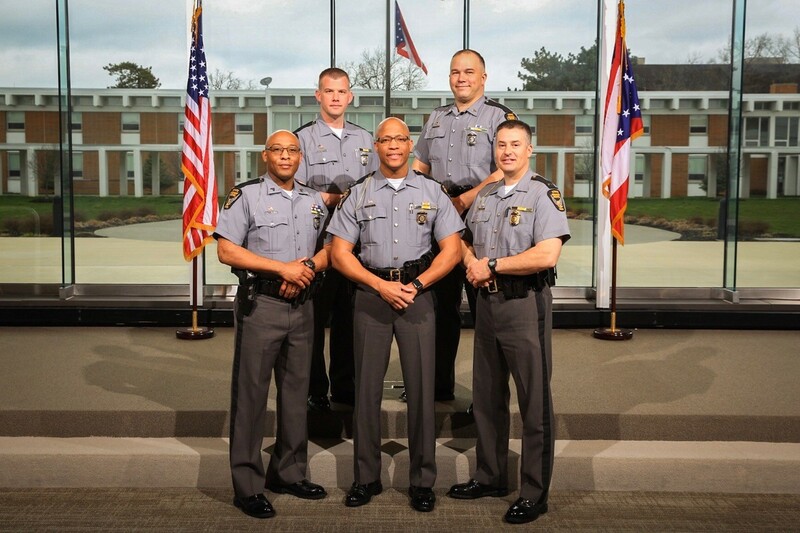 Please join us in congratulating the newly promoted members of the Ohio State Highway Patrol. Back row (left to right): Lieutenant Jonathan A. Gray and Sergeant Joshua Beynon. Middle Row (left to right): Sergeant Michael Mahaffey and Sergeant Timothy B. Williamson. Front row (left to right): Chemical Laboratory Supervisor 2 Nicholas J. Baldauf and Lieutenant Eric S. Damron. On December 12, 2017, troopers stopped a 2009 Mazda 3 MX3 with West Virginia registration for an improper lane change on Interstate 70 in Preble County. During interaction with the occupants, troopers detected an odor of marijuana coming from the vehicle. A probable cause search revealed more than 6 pounds of marijuana, 46 grams of solid hashish and drug paraphernalia. 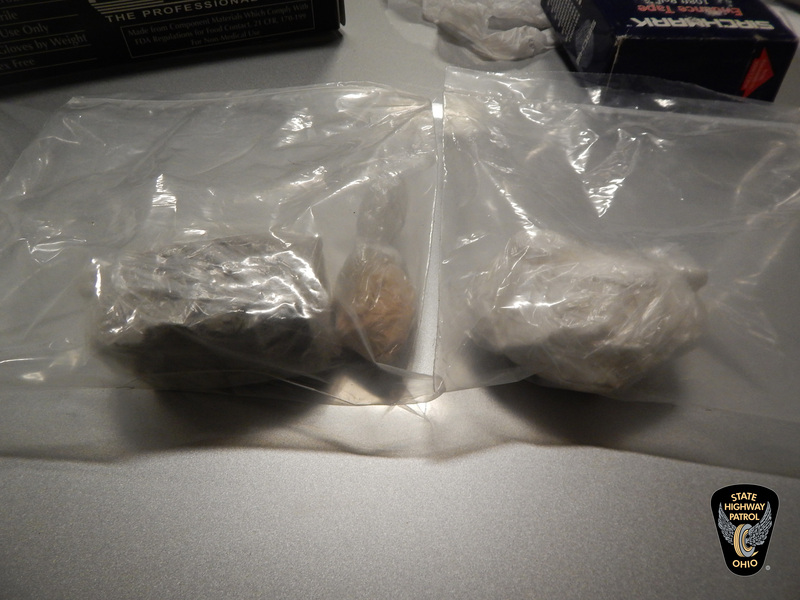 Troopers also located 2 grams of methamphetamine and a pipe on the driver's person. The contraband has an approximate street value of $19,353. The driver, Jeramie D. Walker, 38, of Marietta, was charged with trafficking in marijuana, a third-degree felony, possession of solid hashish, a fourth-degree felony and possession of criminal tools, a fifth-degree felony. Walker was incarcerated in the Preble County Jail. 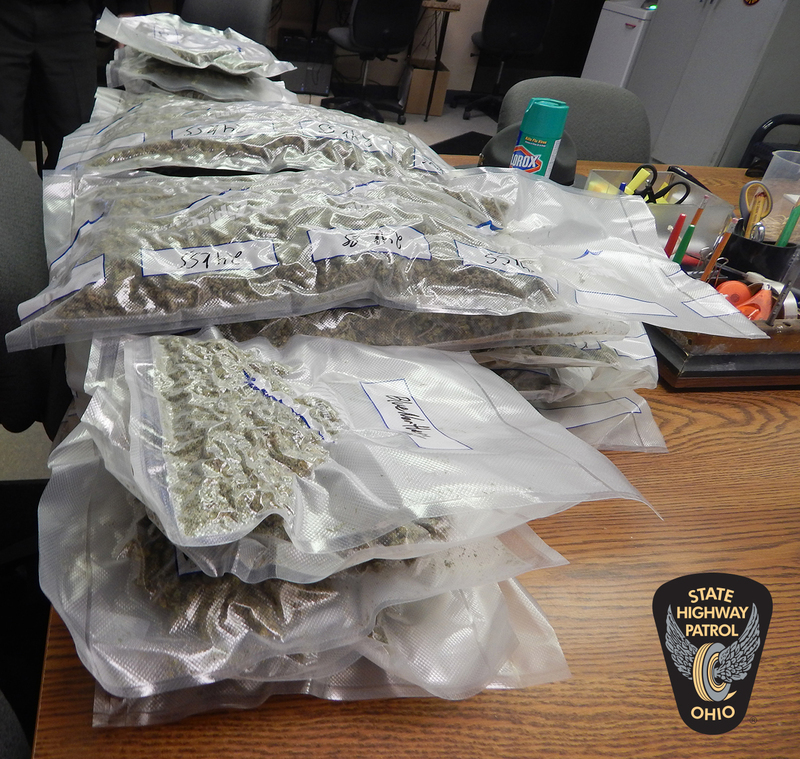 A California man is facing felony drug charges after Ohio State Highway Patrol troopers seized $330,000 of marijuana in a Preble County traffic stop. Read more. The Ohio State Highway Patrol St. Clairsville Post is collecting new toys for children spending the holiday at the Children's Hospital of Pittsburgh. On December 15, 2017, Union Local High School was presented with an award for the highest safety belt usage among student drivers and passengers. Troopers from the Saint Clairsville Post completed unannounced surveys at seven Belmont County High Schools. Union Local students had an 86% usage rate and received a billboard, sponsored by United Dairy, adjacent to the high school that announced their accomplishment. McDonald's also provided "Be Our Guest" cards for a free sandwich to the student drivers and passengers who were wearing safety belts as they entered the school parking lot. During a presentation, Lieutenant James Faunda spoke to the students about the importance of wearing a safety belt and Staff Lieutenant Steven Rine encouraged them to strive for 100% usage. 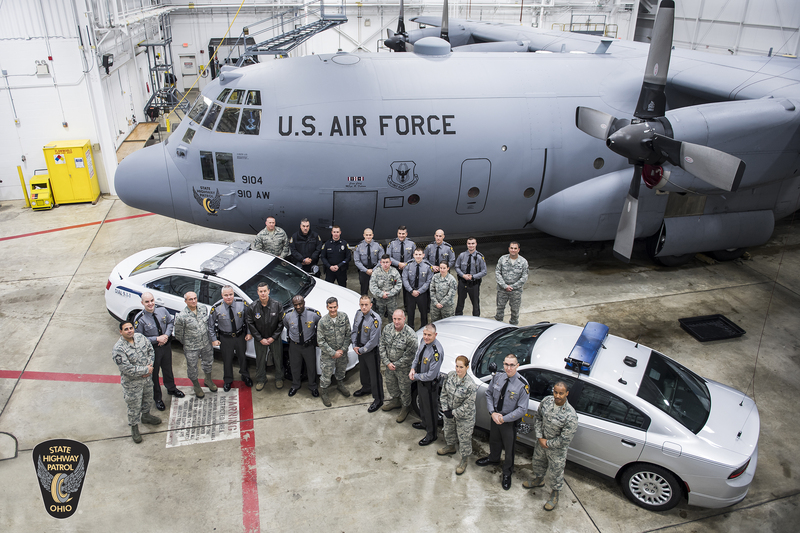 From The Youngstown Vindicator: “There is a lot of cooperation between the Ohio State Highway Patrol and the air base,” Fidram said. “This partnership is a big deal; the nose art shows pride for the military.” Read more.